After breakfast we all went off to the hairdresser. We asked if we could have a deal as there was three of us. She said we could all have our cuts for 10€50 each. We were delighted, and she told us to return at four o'clock. 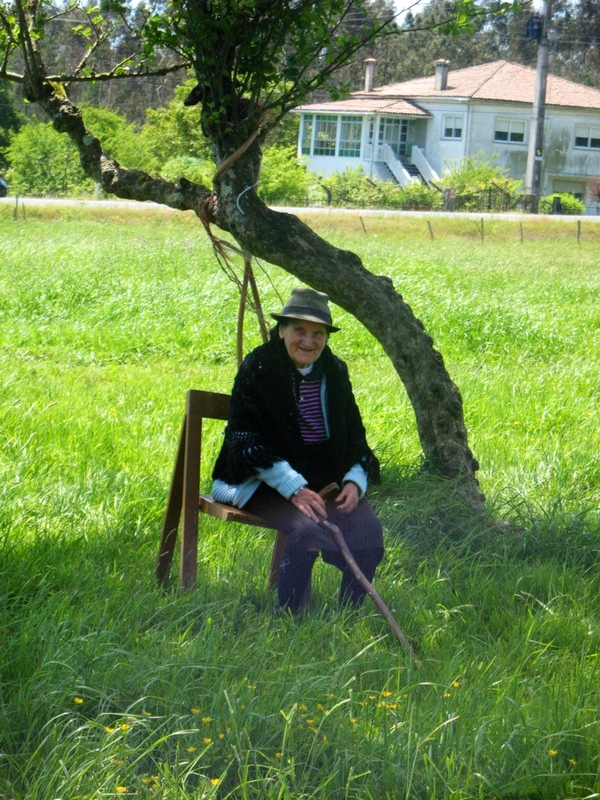 It was now about ten thirty and Di ang Gil wanted to go to the pilgrim's mass at twelve. I also decided to go just to have another try at videoing the fumerio. 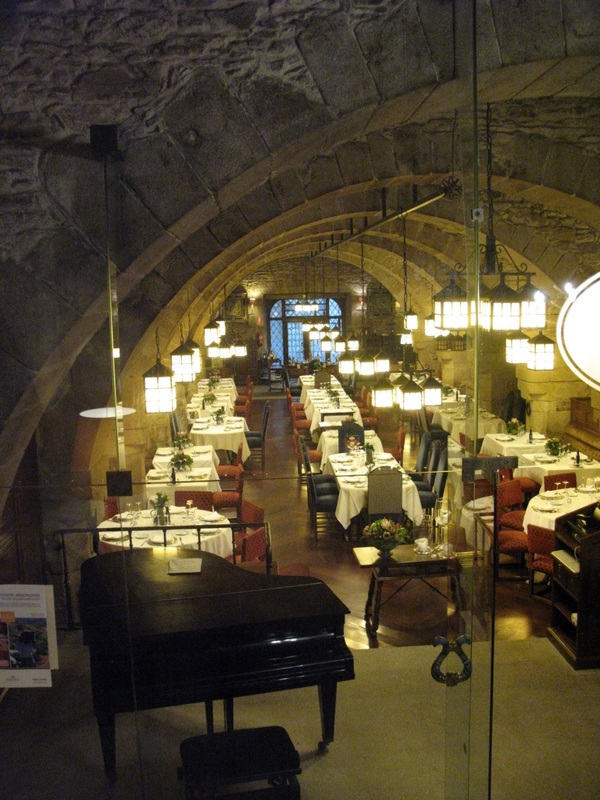 Meanwhile we decided to go over to the Paradores hotel for a coffee so we could have a look inside. The rain was coming down in sheets again and there was some filming going on in the square. About twenty people were wearing just white shirts with bandanas around their necks and white umbrellas everywhere. It was the Spanish version of Master Chef. 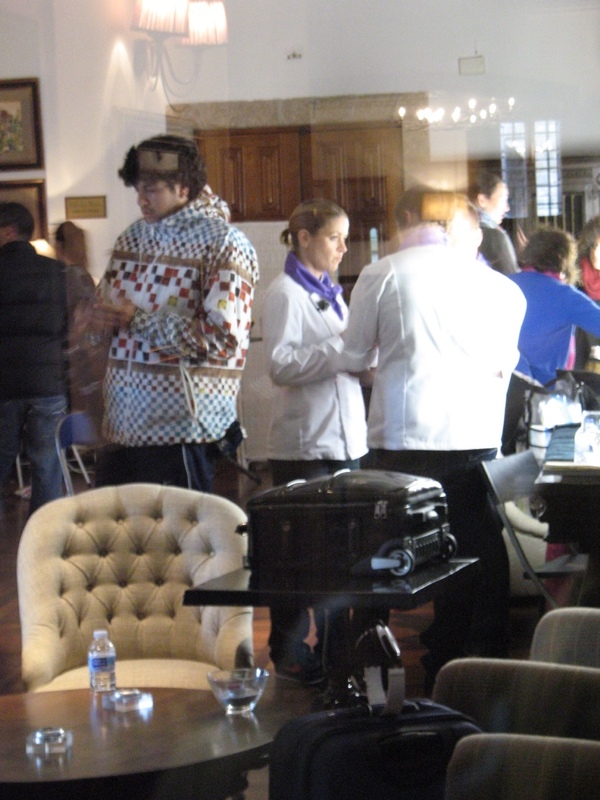 One of the contestants when they came inside. I peeked in a window. On the way to mass another long line waiting to get there compestellas. I went the next day, as all I wanted was a shower. I managed to get a good spot for video, but again people got in front of me at the last moment. They only came in just as the fumerio was beginning. I got a little bit of footage which isn't too bad, but the three hundred euro seat in front of the altar is the prime spot. After the mass we sloshed back to the hotel and had a bite to eat in the little cafe next door. Then it was back to our rooms where I did some hand washing. 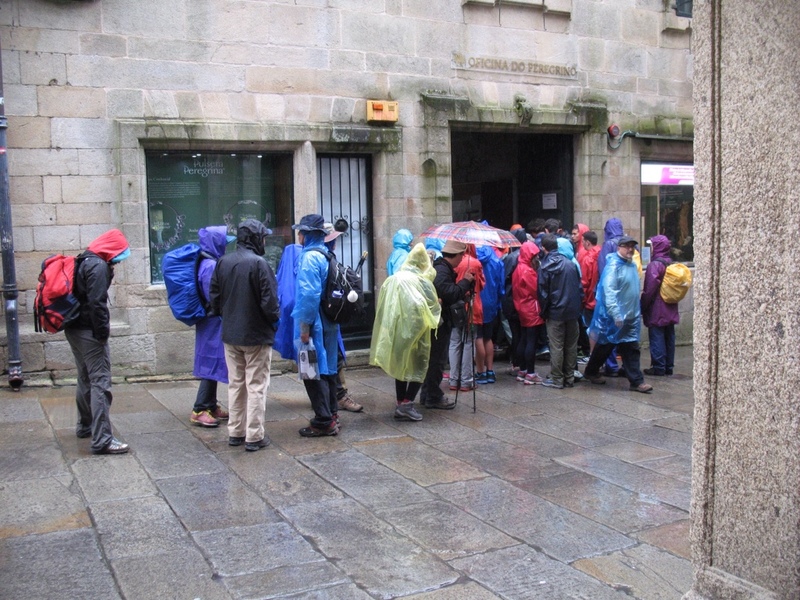 On the way to get our hair done, we called in to the tourist information office and checked out busses for Finisterre. 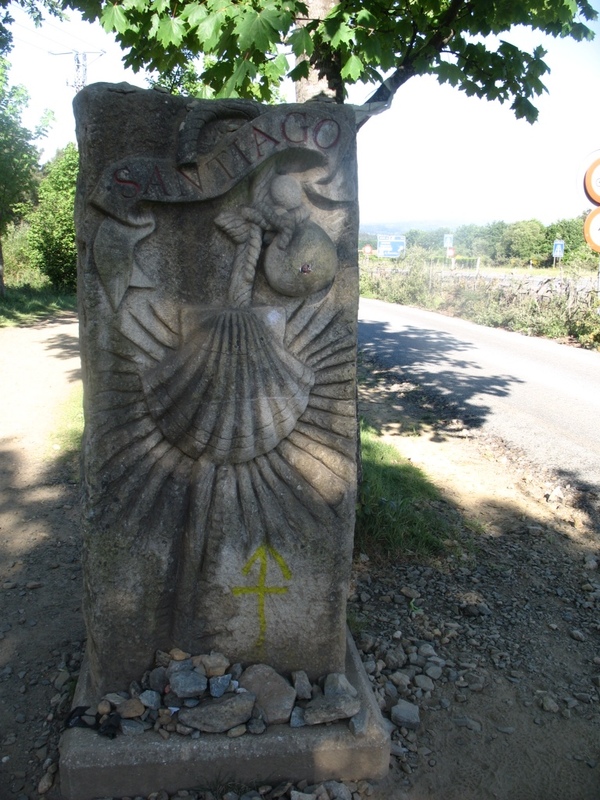 Di and Gil have planned to walk there to finish their Camino and wanted to check return busses. I wanted to find out the times for tomorrow as I might go out there as the coast looks lovely. The problem being it is a three hour trip, and being on a bus for six hours in one day doesn't really get me excited. If I go at nine there is not a bus back until four. 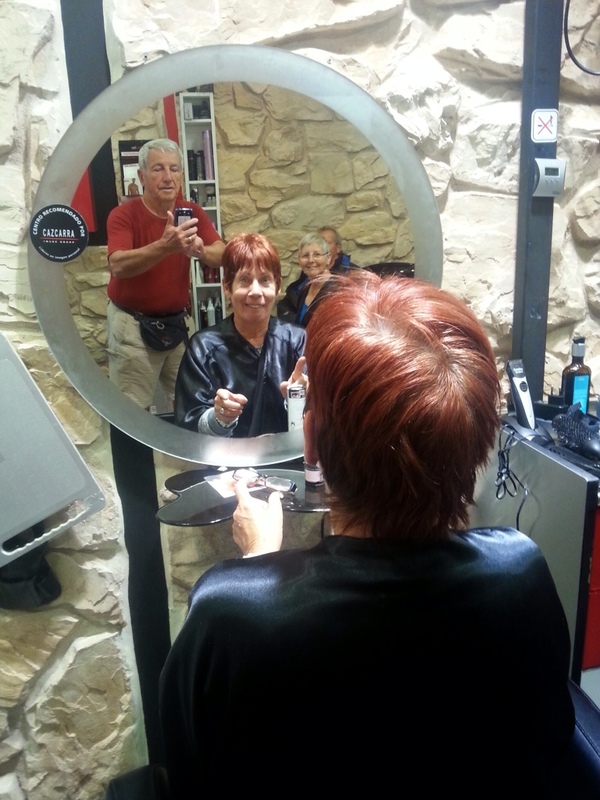 We returned to the hairdresser and she was a terrific cutter, and did a lovely job. She even shampooed and massaged afterwards. True to her word, she charged us only 10€50 each. When we left, the sun made a brief appearance so we went to see if we could get some photos around the cathedral plaza area. I don't mind him being exhausted but I dislike the fact that so many bring dogs along. This dog's ribs are showing, his doggy bits are very swollen and his pads look a bit worn. Dogs were never meant to walk on such surfaces as rocks, blue metal, gravel and such for long periods. Plus the poor thing is exhausted. My model for today. The pups are gone, so I think they must have sold them. The sun was short lived but it remained quite cold. We found a reasonable place to eat, called The Galleon, which actually had the kitchen open before eight. 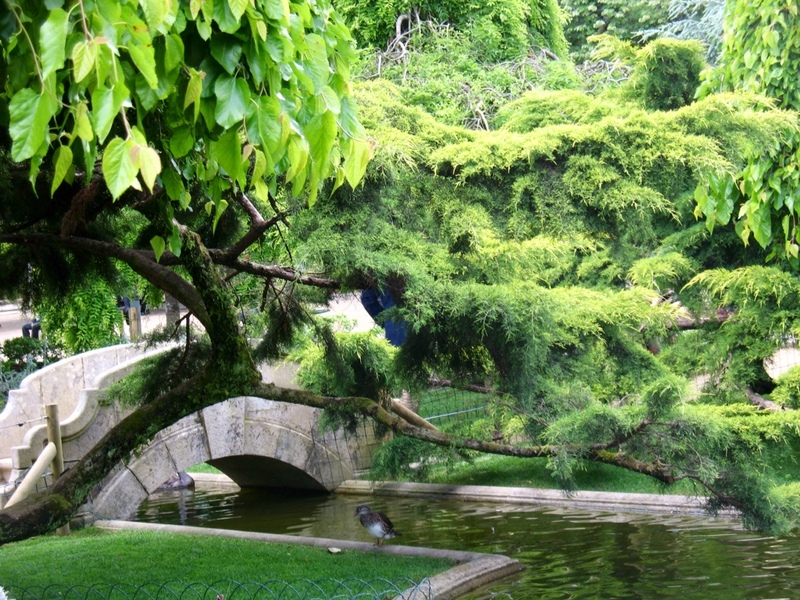 We had trudged around near the hotel, across a park, and back to the Old City trying to get an early meal. All that is available before eight is snacks or tapas. It is very frustrating at times. We find the constant noise an assault on our ears. It's loud music, dogs barking, kids screaming, Spanish yelling and all manner of others. It is a cacophony of discordant sound. One place where it should be peaceful is a lovely little park nearbye, and usually it is but tonight in funfair night which I think goes all weekend. It now adds another level of noise to the existing. 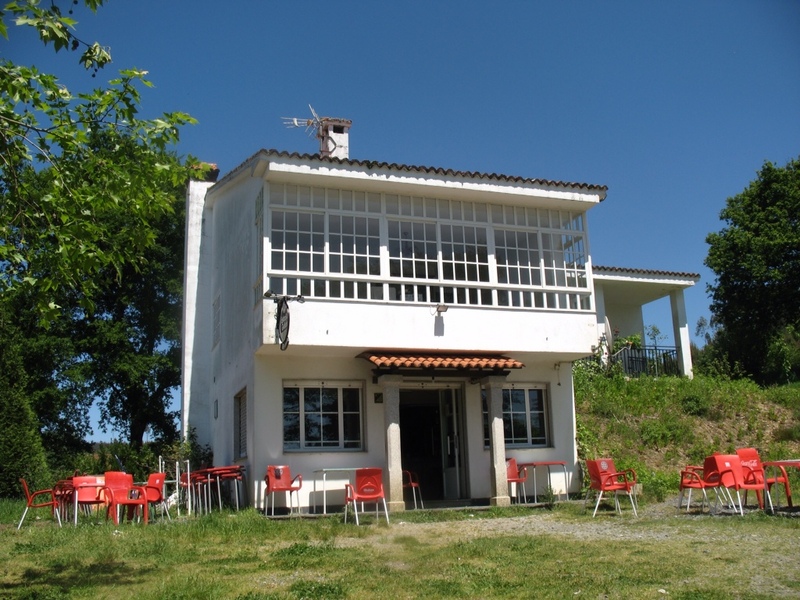 I have, while writing decided not to go to Finisterre after all. I think if I saw people throwing their clothing and boots into the ocean I would see red. I find it appalling when there are so many poor souls here who could use any extra clothing they could get. 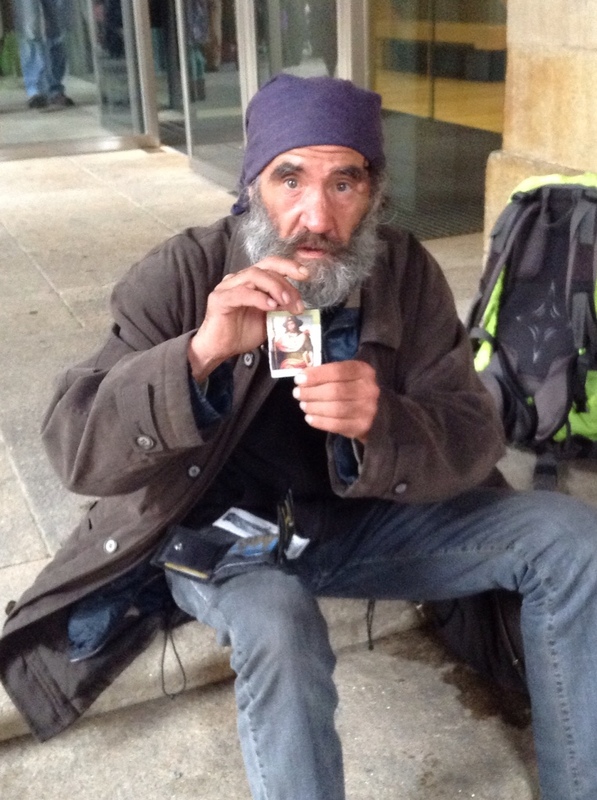 My beggar has his beanie pulled down over his ears, and always gives me a smile when I pass. So, I could not bear to see such waste. Why they go to Finisterre I'm not sure, as it was a pagan ritual which began centuries before Christ was born. Oh, well I suppose everyone has their own thoughts and feelings on the matter. 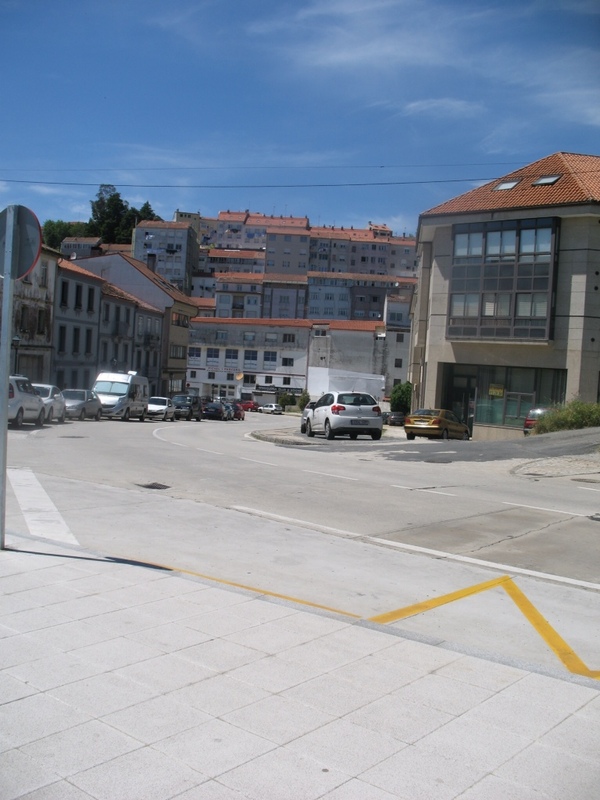 Manuel has suggested I take the train to a nearbye town on the coast, called Coruna. It is about a thirty minute train trip, so that is what I shall do. Hopefully I might get some rain free time to look around. Di goes for the crop as she got the girl to razor out all the colour. She is going to embrace grey. If I'd known so much of my grey was showing I would not have suggested this shot! 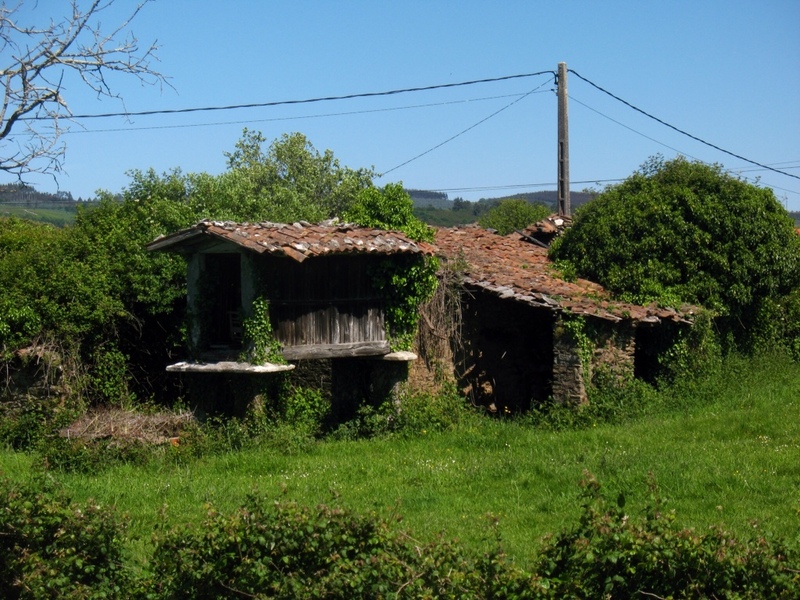 The rain in Spain falls mainly….. I have just been down the road to a hairdresser. They wanted 31€ for an inch cut off my hair! No way Jose. I returned here and Manuel on the desk was also surprised at the cost. He reached into his drawer and pulled out a pair of scissors, making snipping motions. Nice to have laugh. I went to the perfume shop across the road where a lovely girl named Vera gave me a sample of Channel perfume. I smell nice now. I asked her about haircuts and she said it is very expensive in Santiago. It sure is, as I saw signs all the way here for cuts at 9€. I will check the price in the old city later as someone on the forum said they got a haircut there for 10€. 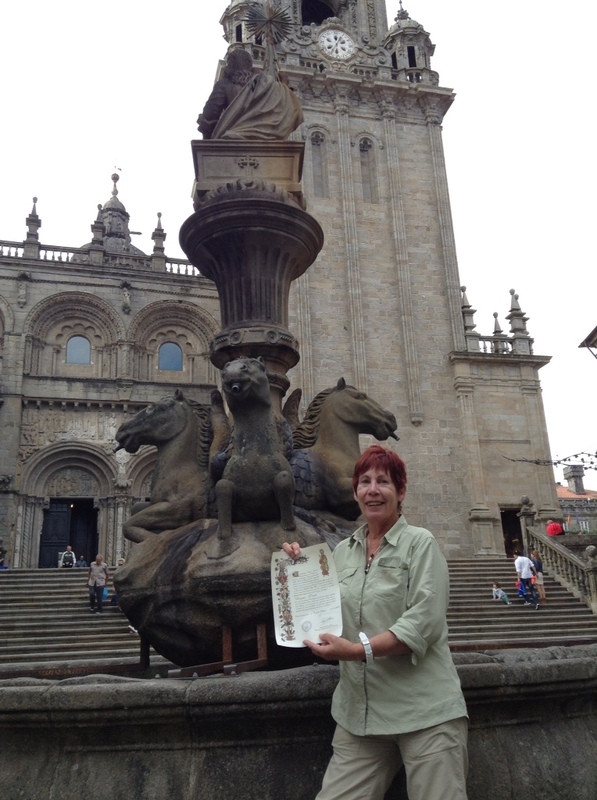 I went up to the plaza area in front of the cathedral this morning to meet Di and Gil. The sun actually peeped out for an hour. I waited until eleven and realised I must have missed them. Coming in from the Way is very confusing, and people were coming in from various entries. Some, like me, went in the back of the cathedral which brings you out by the horse statues seen in my pictures. 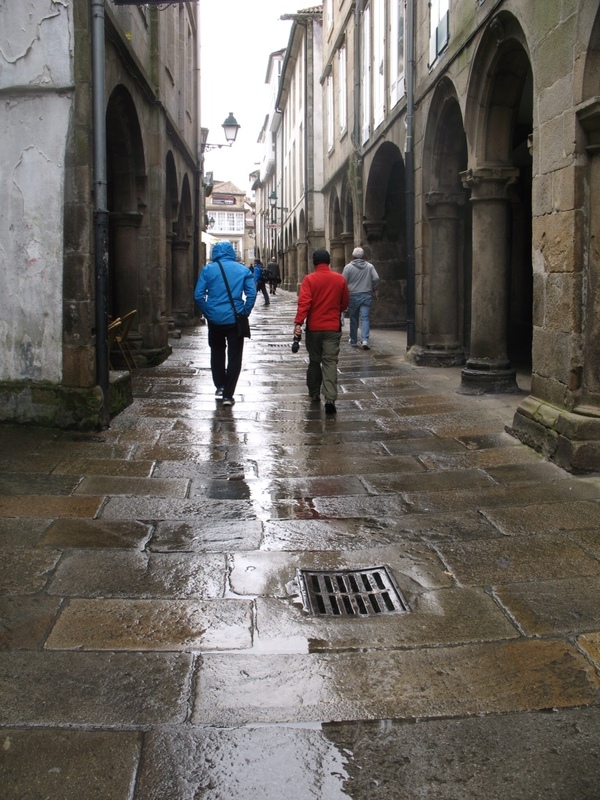 There is actually a small tunnel like entry where a fellow busks on a bagpip which is where pilgrims come I as it comes out into the main plaza in front. 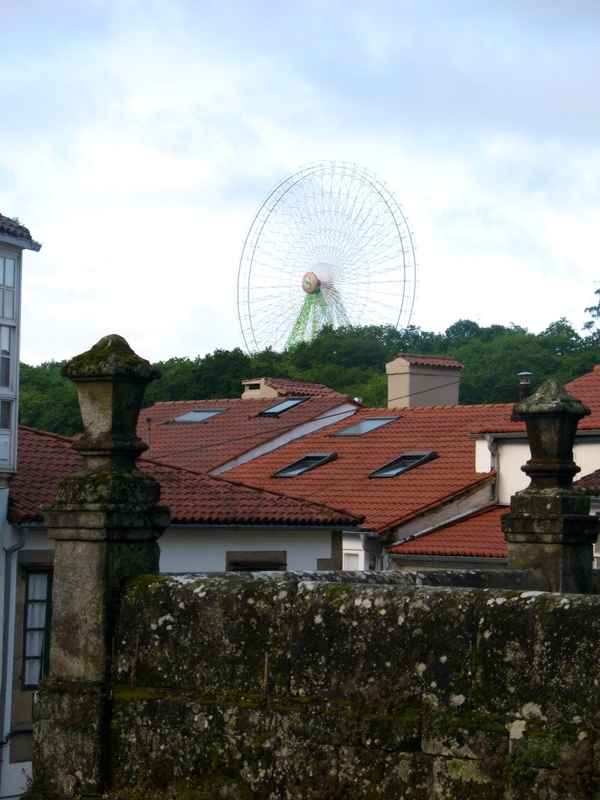 A Ferris wheel that looks strangely out of place. I went to the pilgrim area where people go to get their compestella but they weren't in the line. I dashed back to the hotel to check my email, and they had sent a message saying they were getting their compestellas! I had not thought to go and see if they were inside. I quickly left the hotel and as I rounded the corner, there they were trying to find their way. Great cries of joy as we all went into a big bear hug. They are the nicest couple on the planet. The Paradores hotel. Very expensive at 240€ a night. In an original pilgrim building which housed pilgrims. Anyone can go in for a drink or coffee. I must do that before I leave. While they were waiting for their room to be available we went to the little cafe next door and had a beer or two. Plus we got tapas. 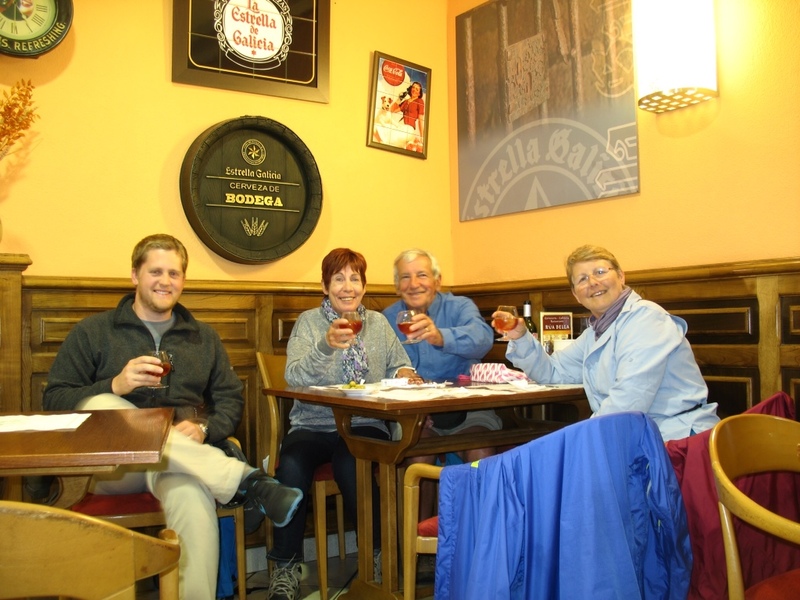 I noticed the other day that some people had tapas with their beer or wine which is supposed to be the norm. I had a wine there the other night and got no tapas. Today as the fellow put our beers down I mentioned the word, “tapas” and we got them. Hmmm. Poor Gil. It wasn't long before Di and I were in fits of laughter as he fiddles with his smart phone. Everytime he goes to take a photo he has to enter his password, then he tries to put the flash on or turn it off. Meanwhile we are frozen with glued on smiles as he flaffs around. It only took me to say, ” I see he's still fiddling with his apps,” and we just collapsed in fits. Sadly he accidentally deleted that one. We spent a good hour exchanging stories and the staff must have thought we were a bit loopy as we all just kept laughing about various shared moments. Di named a step we did 'a Trish walk' because when we staggered up to Orrison I invented the ten steps and breath for ten seconds. Then we would try 12 steps, then 14 etc. Di said when the mountains got steep she would do the 'Trish method'. Us trying not to crack up as Gil fiddled with his phone. Di managed to hold it together..
We are meeting at six to go out for dinner, but not sure where we will go just yet. 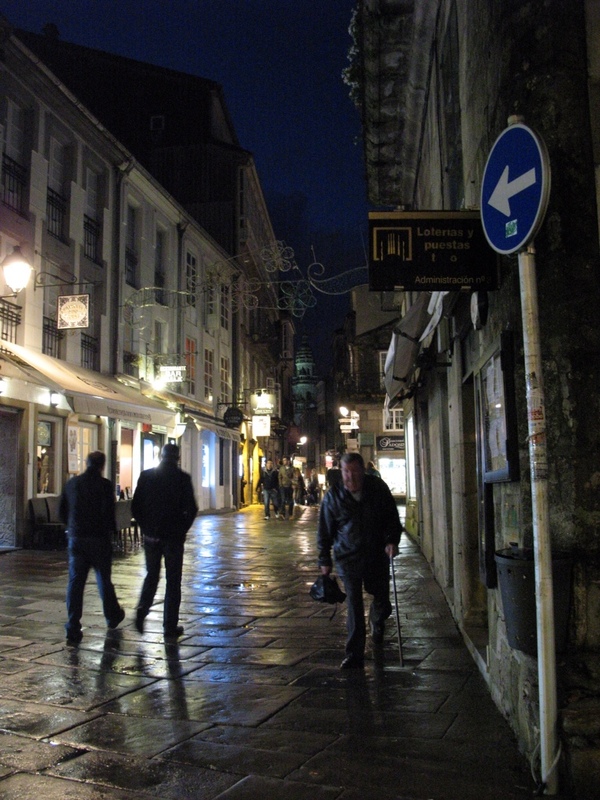 We wandered up to the old city looking for an Italian restaurant which seems does not exist. We found one that had spaghetti on the menu so we went in there. We didn't really care at that point as we were getting drenched. The spaghetti might have been cooked on the premises but the sauces surely were not. Regardless of the food quality, we had a fabulous time, and Di and I seem to bring out the worst in each other and just explode laughing at Gil. Gil is a bit naughty and sometimes has a tad too much to drink. In one hostal they stayed at he fell asleep on the toilet and fell off, cracking his nose on the floor. Poor Di found him bleeding every where. When she was telling the story Gil was trying to get sympathy but we just kept falling apart laughing. At the next table was a nice young fellow eating alone, so we began chatting to him. It turned out that he is filming for Expedia and is rushing from one famous place to another. 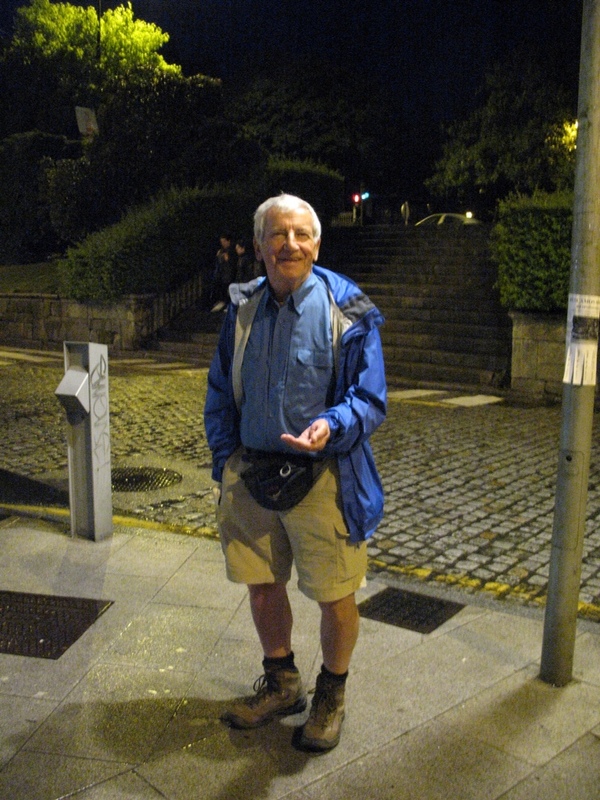 He had no idea of what was significant about Santiago, or that it was the end point of the Camino. Anyway , he was a absolute sweetheart, and the image of Michael Bubble (?). His name is Dale and he is from South Africa and is an Afrikaans without the attitude some have. He really was wonderful company. We finally left the restaurant and headed back to the hotel. 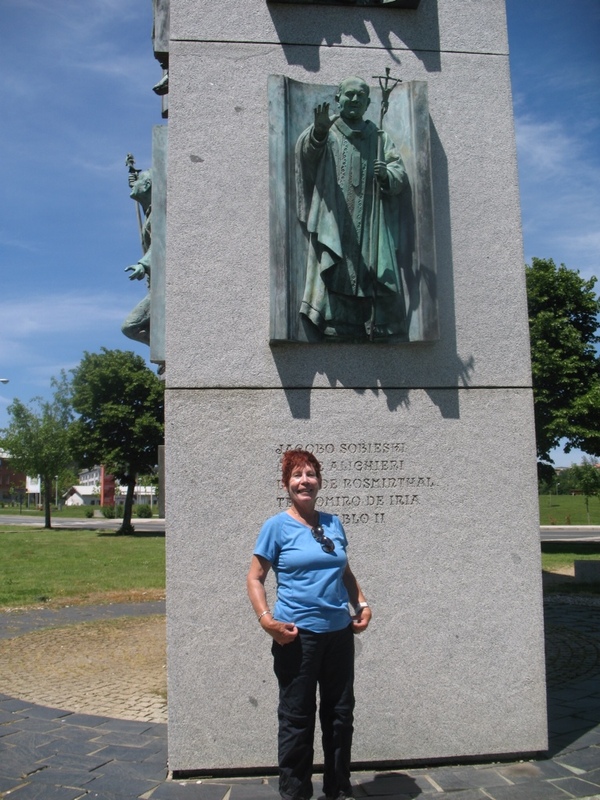 Tomorrow Di and Gil want to go to the pilgrim mass. I shall meet them afterwards, though we will have breakfast together. I found a hairdresser near the restaurant who charges 22€ for ladies cut! and 10€ for men. I told her I would be back for a hombre cut tomorrow. A lonley beggar disappearing up an alley. Streets of old city nearly deserted. 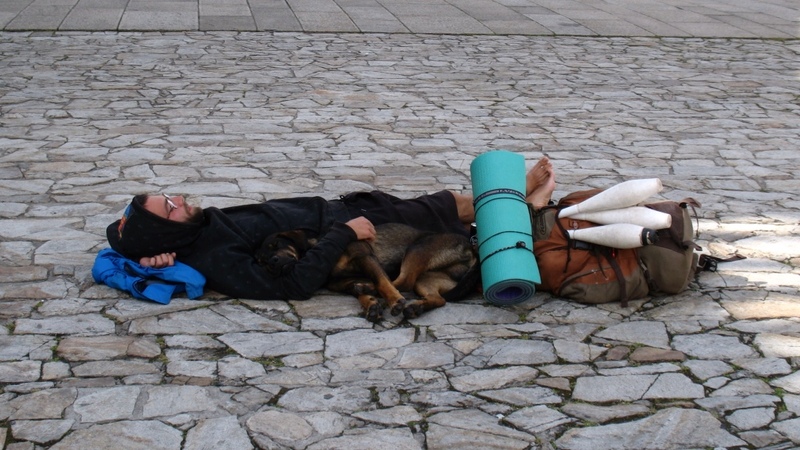 They are probably going to walk to Finisterre (end of earth) starting on Saturday which will take about four days. They will bus back, and then fly to Barcelona. It turns out that our paths will cross there! We are already planning a night out. That's it for now. I am sleep typing. The weather has continued to deteriorate and there is no respite in the next few days. This is actually the normal pattern here and the sunny hot days we had are apparently very unusual. I have spent most of today trying to sort out my storage problem. I went first to Cyber World, where the young woman, Lupe, tried every thing possible to download my photos, without success. They have only early versions of windows, plus she said the computer needed a program called 'Items' which they didn't have. Bless her, she then rang Apple and told them the problem. They told her I could buy a mini external drive to store the photos on. I went over by taxi as it was quite far, and I would have become lost, wet and cold had I tried walking. The mini hard drive was 130€ which I decided not to buy. The young fellow there had quite good English and said as the boss was not in he would download them for me. It's so nice when people try to help. It took a good hour to download to his computer and then it turned out I had nine gigs of photos, and my flash drive was only eight, so I then had to buy another one. By now it was getting close to two o'clock, and only a little had downloaded. The fellow serving said most people hate the two o'clock closing, then having to come back later until nine, but that is tradition. I can understand that, because it means they can't even use the time to do their own shopping. We finally decided that he would keep the download going on one flash drive, and when he returns at four thirty he will start the other one. I shall return at five thirty to pick it up. I must give him some euro for his help. On the way back I popped into the 'net cafe, to tell Lupe the outcome and she promptly picked up some paper I had been using to write notes on. It was my airline eticket for Barcelona!! I never would have known where I had left it. I thanked her profusely for her help and for holding onto the paper work. She was a really nice girl and was pleased Apple had helped. I returned to Apple around six and the young fellow, whose name is Ivan, had both flash drives ready for me. He refused to take any euro as he said it was not allowed. I went to the only shop of any sort nearbye which was a cafe, and bought all three staff a chocolate cake each. I decided to have a wander around the old city when I got back as at least it is full of like minded people. Well usually. The rain was hurling down, so I gave in and bought an umbrella which made things more bearable. I bumped into Allan who was buying tee-shirts, and a couple of others who I have met briefly. 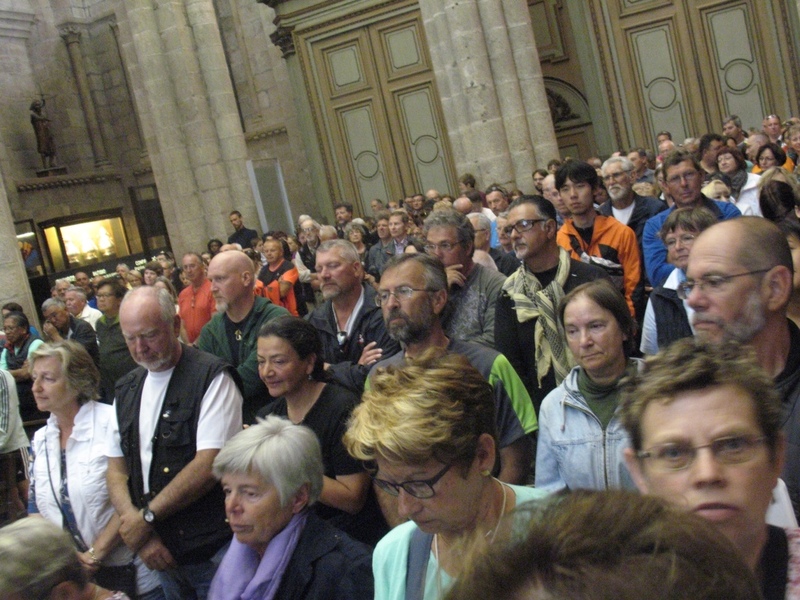 There was a huge demonstration on the steps of the cathedral which was quite heated. One woman on the street asked if I knew what was going on, which at that point I didn't. I later asked a young woman who was in the demonstration if she could tell me what it was about. 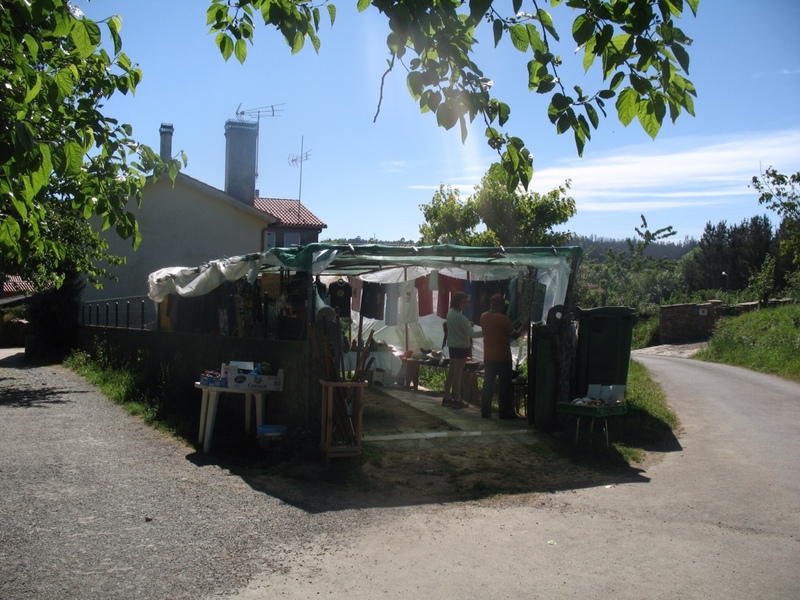 In halting but fair English, she explained they were from a small town, not far away, named Monterrei which has a beautiful castle, but because it is not on the Camino, the government will not build a hotel in the town. ( I lost a little here so unsure if the government would not fund or would not approve). 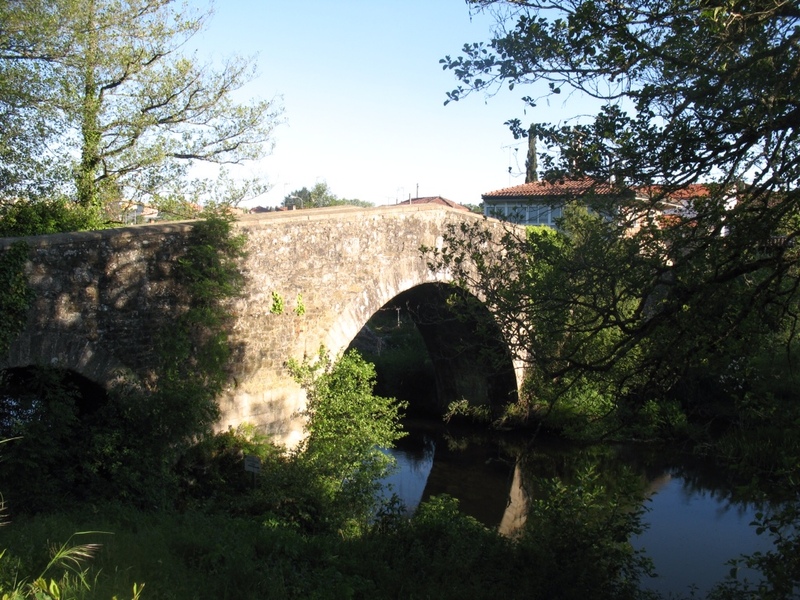 She said people were very angry that only towns on the Camino made any money. Funny, that's the impression I got. As I was leaving the area I spotted a couple of characters sitting on some steps. I was cursing because I had only the iPad with me and not my camera, but asked permission to take a photo anyway. 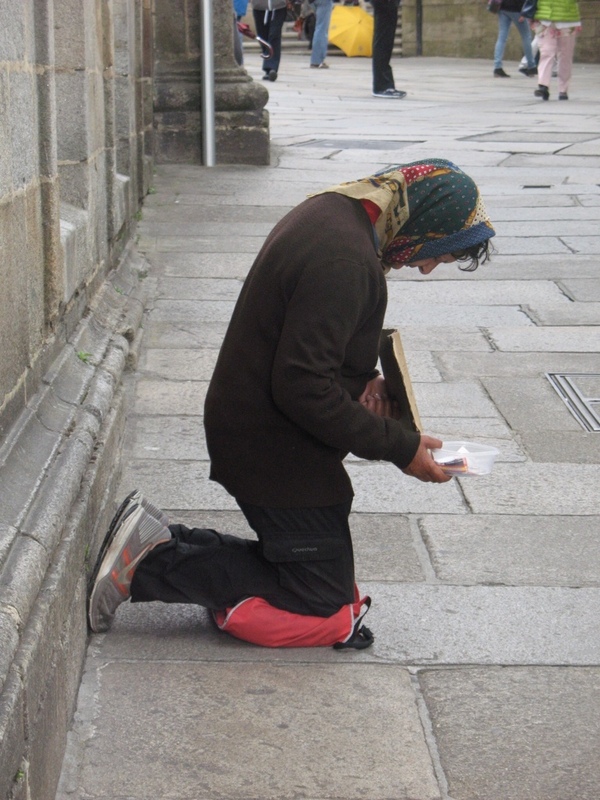 I gave out cigarettes and I got back a holy card of Santiago. This was one the men's pack. I am unsure whether they are walkers or street people. The man not on camera pointed to a small black dog curled up on another pack, then he crooked his finger to call me over to the above litter. 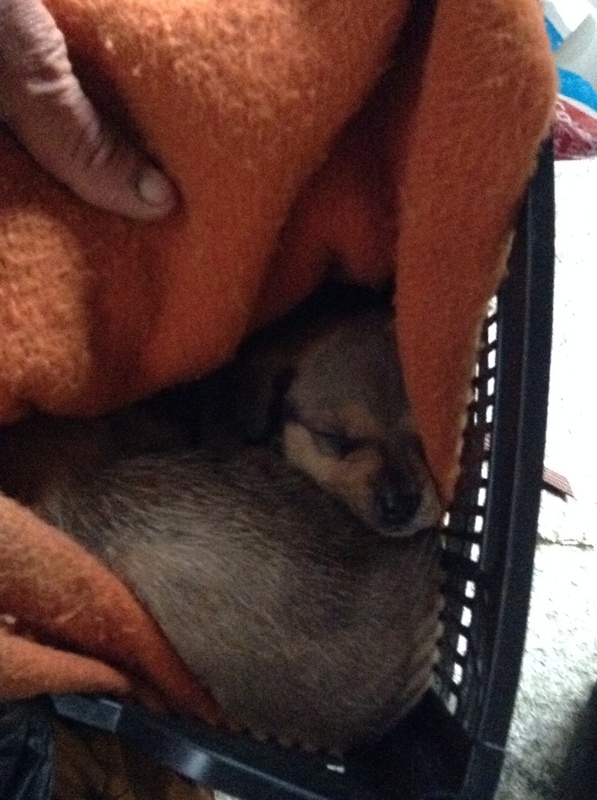 There were two dear little pups curled up as warm as could be, and obviously well looked after. I surmise that the other dog is the mum. I'm quite glad I went out in the rain. Di and Gilbert have just emailed to say they hope to get in by ten in the morning, so I shall go and hang around the front of the cathedral and welcome them in. 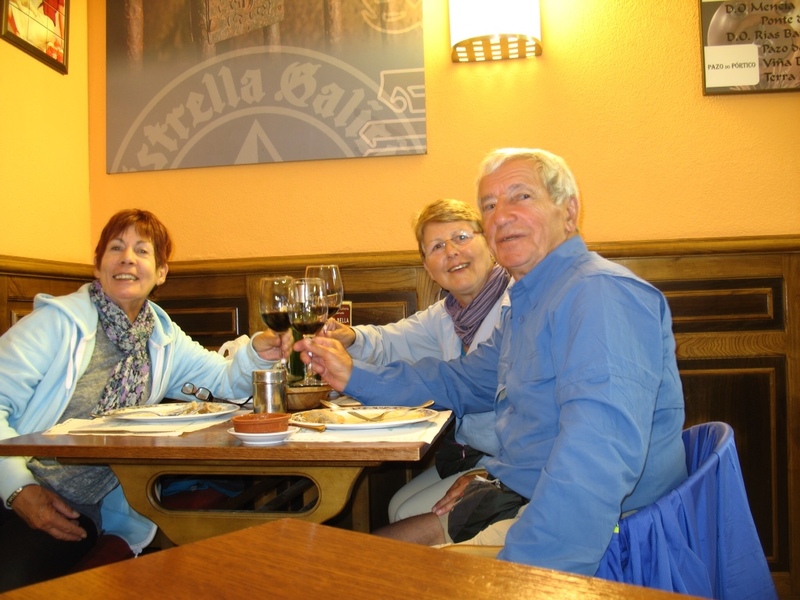 Maggie has just left to catch her flight as she is off to see the Alhambra in Granada. Then she is going to Ireland to visit friends. Like me, she thought as she was here she would see what she could as it is so expensive to get here from Australia. Also, like me, she just wants to go home. I must say she had the brains to forward on extra clothes! I am all packed ready to change rooms, and I can do little about buying shoes or tops until later as no shops open until ten. Of course all the souvenir places in the old city will open before then. The weather is horrendous at the moment, and it has bede pouring with rain all day. I feel sorry for those out on the Way. I went out to the big shopping mall and got a few cheapish items of clothing. It's a huge centre and most of the shops are labelled brands. There are two there a bit cheaper much like Target and Kmart. I then returned to put my hiking shoes back on as my feet were wet just from getting in and out the taxi. I met up with Chaya and Sheree for coffee in the OC. We then browsed around all the shops again for a little while. Chaya can't do much walking as she has tendonitis in both ankles. 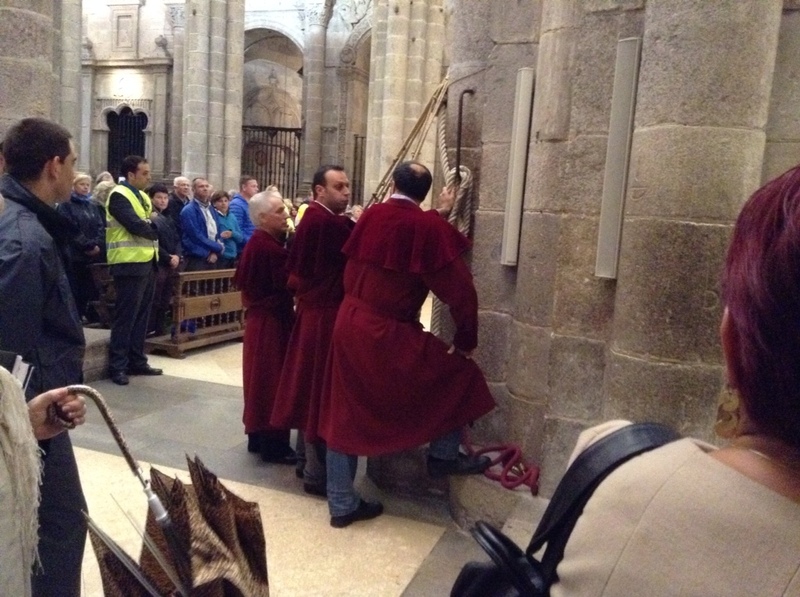 If the rain holds off I might meet them at the cathedral as they are going to mass with a lady they met on the Camino who has paid for a special mass for a friend. I shall get more details about that. They leave in the morning to go to Turkey, and said I should go too. I shall not be shelling out any more money for extra trips, and I have been there anyway. I don't know what the arrow thingy is unless it's Spanish for Windsor Hotel. 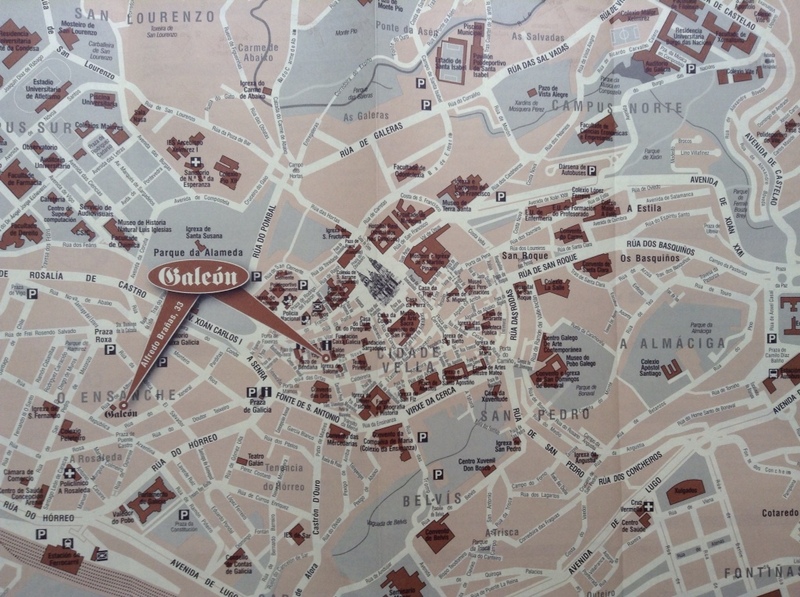 Anyway the bit where you can see the cathedral is the old city and you can see the roads kind of circle around it. Well, it turned out to be quite an interesting evening. I went over to the cathedral and sure enough Chaya and Sheree were sitting right in front of the alter with about fifteen other people. 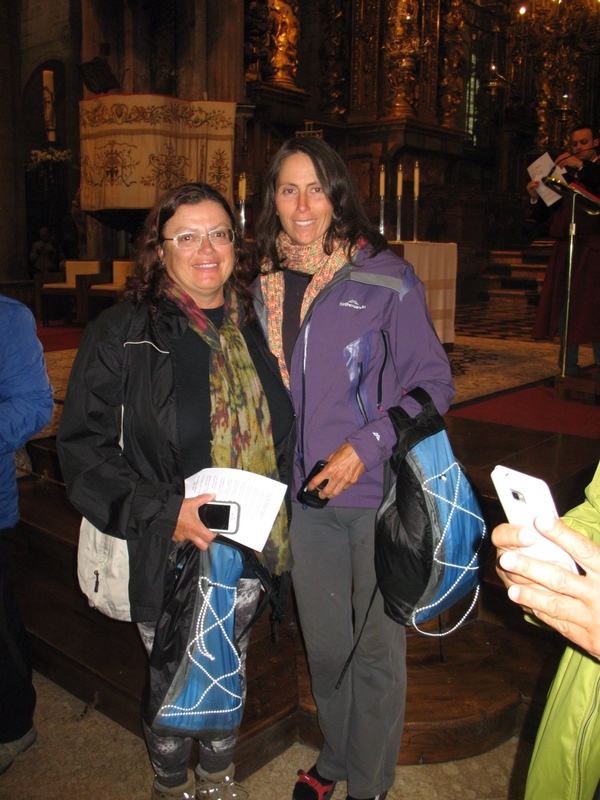 Apparently the bono fumerio is not always used, but if you pay for a special mass it is done. The audience was not as huge tonight so there was seating for all. I wanted to film the fumerio but my iPad ran out of room. Chaya, being right in front got fabulous footage. I still don't know what the lady in question wanted the mass for, but we all went off for a drink afterwards. 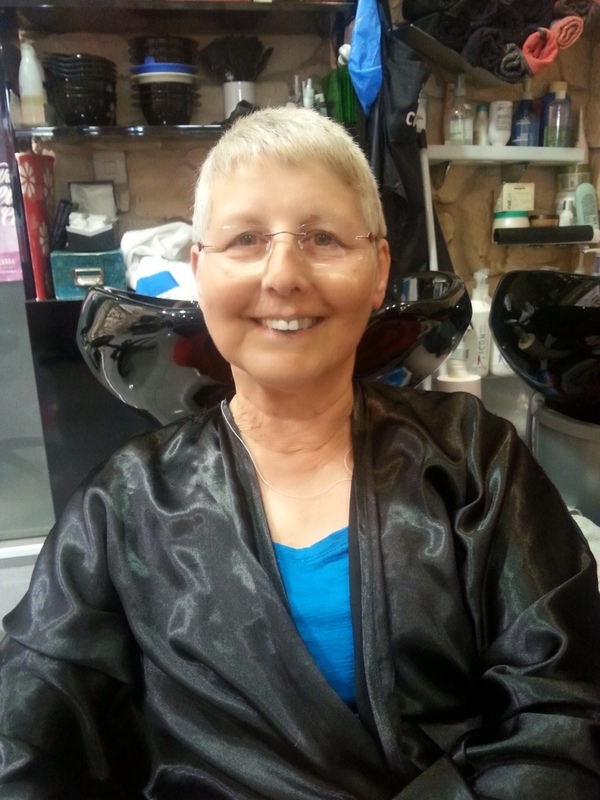 One of the group was Annette whose feet I treated weeks ago. She gave me a big hug and thanked me for 'rescuing' her. She is here for a few days, so we might meet up again. On my way to the cathedral I bumped into Mike and Juan who Jennifer and I met a few weeks back. It was lovely to catch up, but I was running late so I had to dash off. We said we would look out for each other tomorrow. 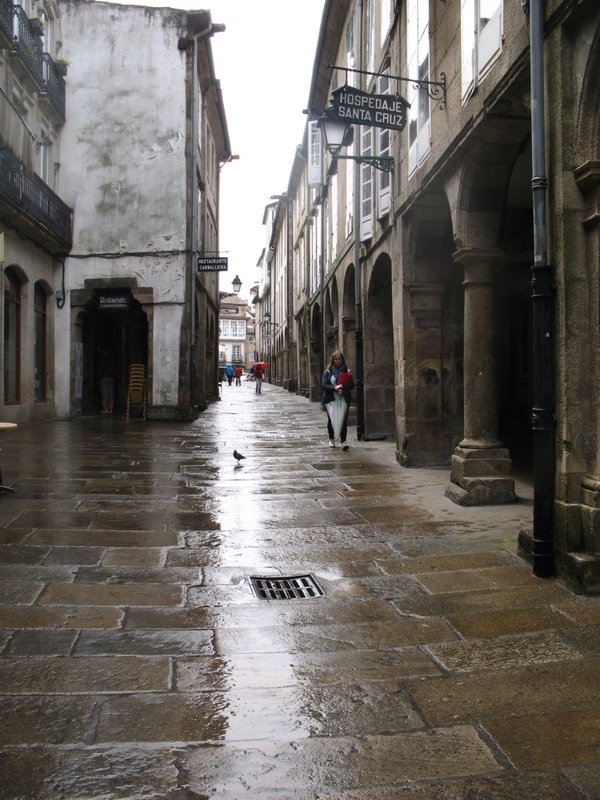 Nearly deserted street in old city due to rain. Where we caught up early in the day. 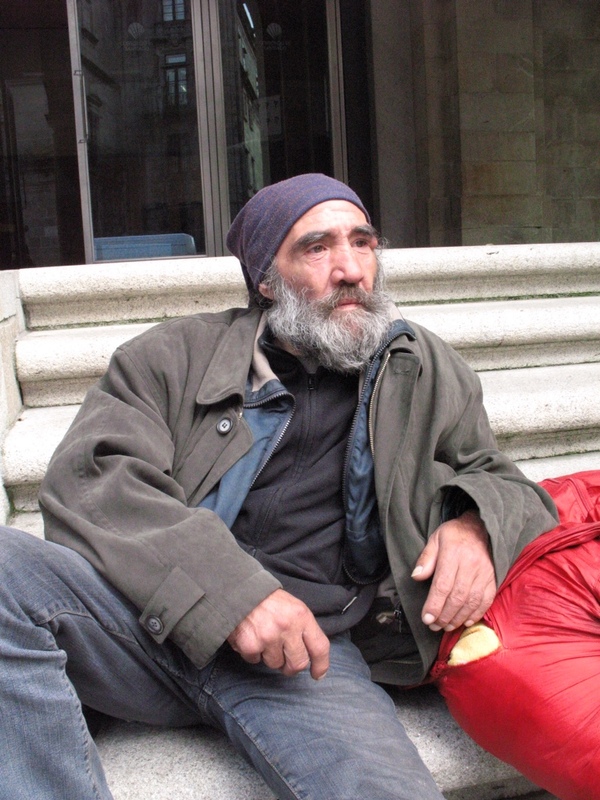 On my way out I saw the beggar to whom I gave the beanie. I tapped on the head and asked if it was good. He smiled at me with such gratitude, I felt really awful to be complaining about the rain. A long line of pilgrims. Poor things have arrived in the pauring rain, then they have to stand in the cold waiting to get the compestella. Sherrie and Chaya at the service. Chaya, Sherrie and I left the others and went off to find food. They were hoping to meet up with Miguel and Allan who they had walked with for some time and wanted to say goodbye to. 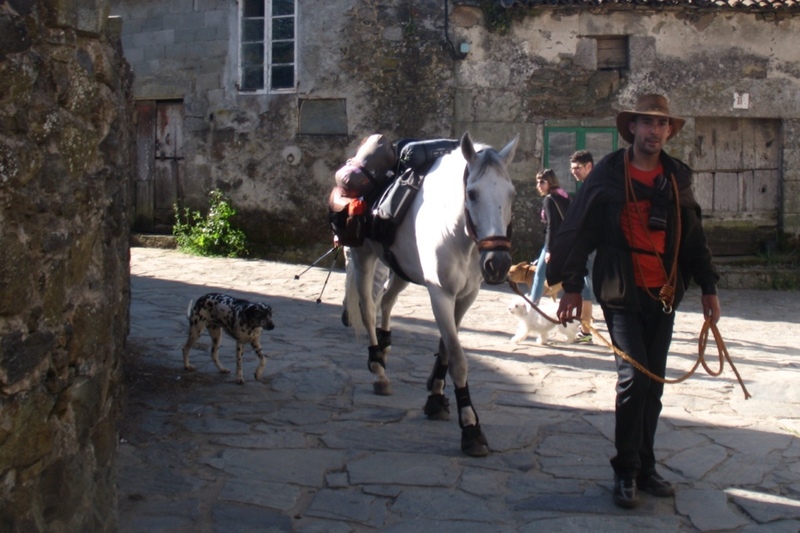 Miguel's sister had joined him and the three of them, plus two others hired a car and drove out to Finisterre. Many people are now walking that section, but in this weather it seems a bit silly. Anyway they eventually turned up at about ten, and it turned out Allan and I had met a few weeks ago. I remembered him telling me he thought his sister lived in Manduah. It's a small Camino. Eventually we all had to say our farewells and if it was a movie there would not be a dry eye in the house. The girls found it hard to part with Miguel, as they saw him as a temporary son, and Allan they had also become close to. Then of course there was us. It feels as if we have always known each other and it just felt wierd knowing we wouldn't bump into each other 'down the road somewhere.' Yes, tears were shed. 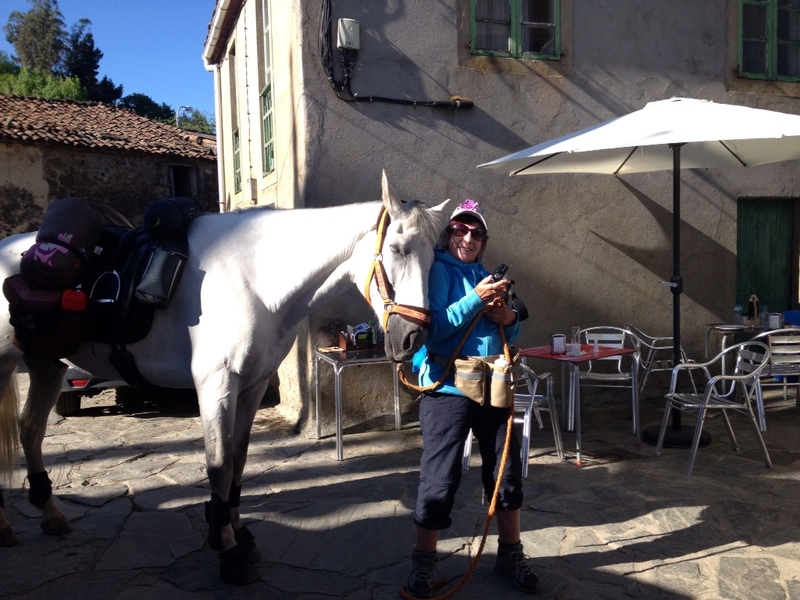 Maggie has emailed from Granada and has met some nice people. She also got told off for putting washing on the balcony. Goodness some people are picky! Today was mainly wasted on trying to sort out my iPad problem. We went to two photo shops who just shook there heads and pointed to the 'Apple' and said no. When I asked about blue tooth I was told it was locked. No idea why that would be. Then off to an Internet cafe, where the fellow did try to plug the iPad in, but I don't think he knew what he was doing. All this took forever, and no luck at all. Meanwhile I have deleted some photos to try and make room. Sadly I deleted the 'pilgrim' I posted yesterday, and I know the blogged one won't be a good resolution; never mind. Tomorrow I will ask if I can use the computer at reception and hopefully can resolve the issue. Meanwhile I have managed to download a few from yesterday. They are not too good as it was pretty hard given the lack of space and lighting conditions. Standing room only. It is hard to tell here but the service is presented to three areas. 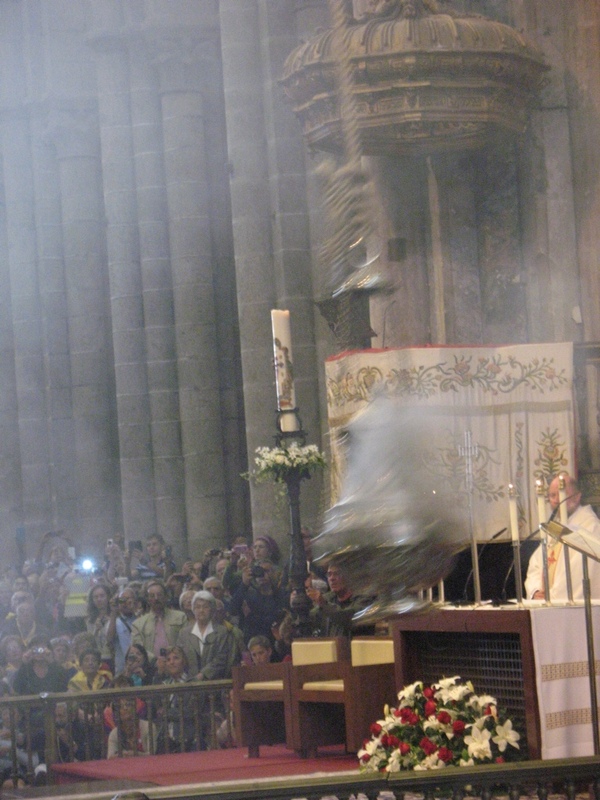 Here you can see two, and there is another directly in front of the altar. 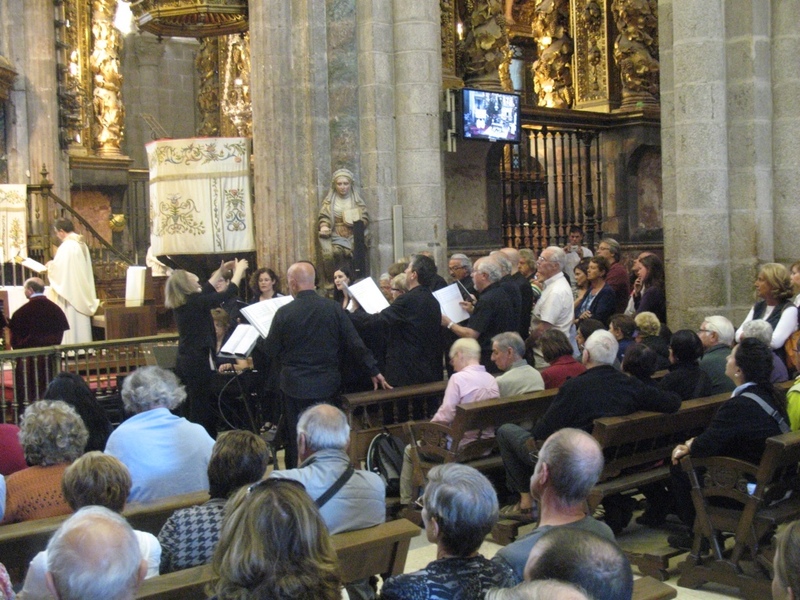 To the right, in the black, is the choir. This is how packed it was behind where we were standing. Swinging past. A video is really needed to get the scale of the passes. It certainly is an impressive sight. As mentioned I really need some clothes, but can't find an op. shop! I saw an Oxfam shop today and got quite excited, but it turned out to be an office! Oops. I did get a pair of jeans and a top, but it's very pricy around here. I can roam around here in hiking clothes as it's not unusual, and quite the norm in the old city. FYI. The cathedral is in what was once a walled city, and nothing much has changed there building wise. It is a labyrinth of alleys, and ancient buildings. Outside this old city is all the present day buildings etc, like any other town. It lacks any charm at all, as the buildings loom above the streets in a most unattractive manner. 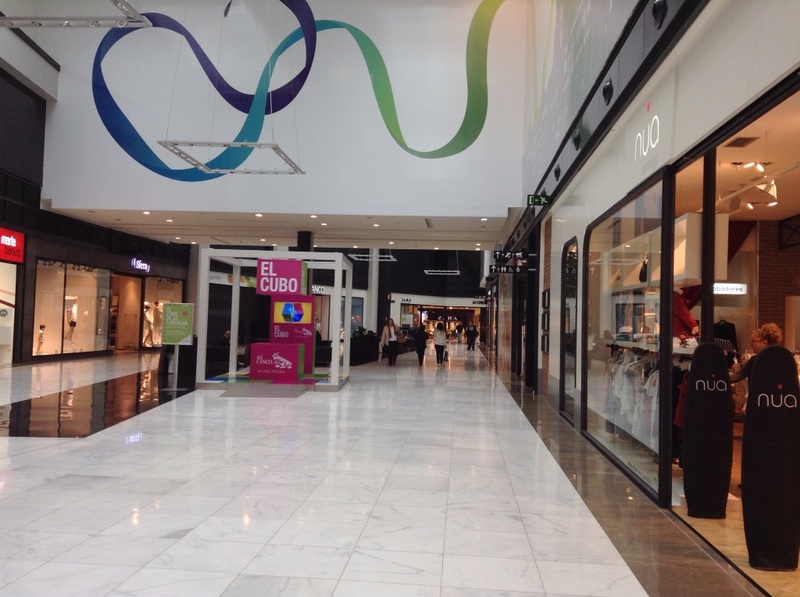 The shopping centre we went to the other day is very modern and smart. I might go over there again to see if I can find some cheap shoes. 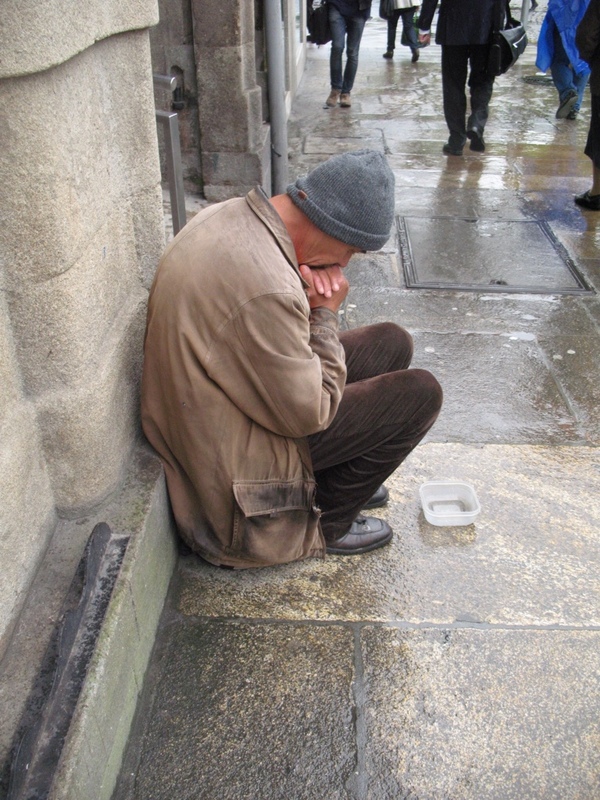 The beggars here are most distressing, as they are everywhere, in the old and new cities. Most of them kneel all day in the same spot. Just awful. 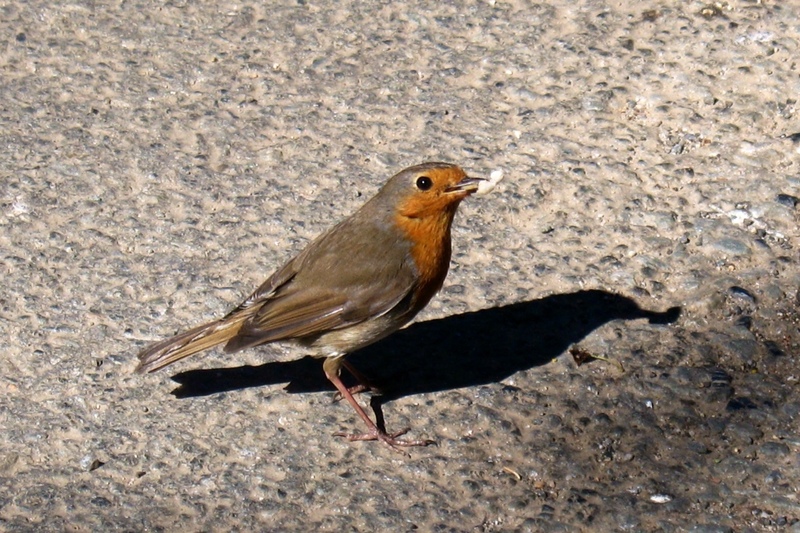 I gave one fellow my woollen cap, as the weather turned cold. He was most greatful, though he didn't have it on today. Maybe he swapped it? This lady is in her seventies I think. She was there all day. I gave her some money but I can't give to them all. She is the only one I have seen with something under her knees. I went to the cathedral today to light a candle for Lucianna, and had a quick look around. 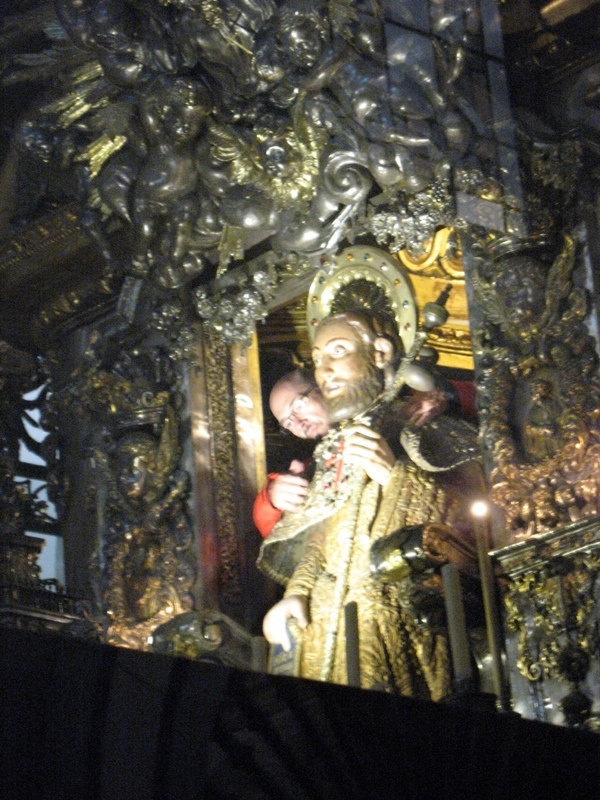 I get very confused about the St.James and Santiago being the same chap? 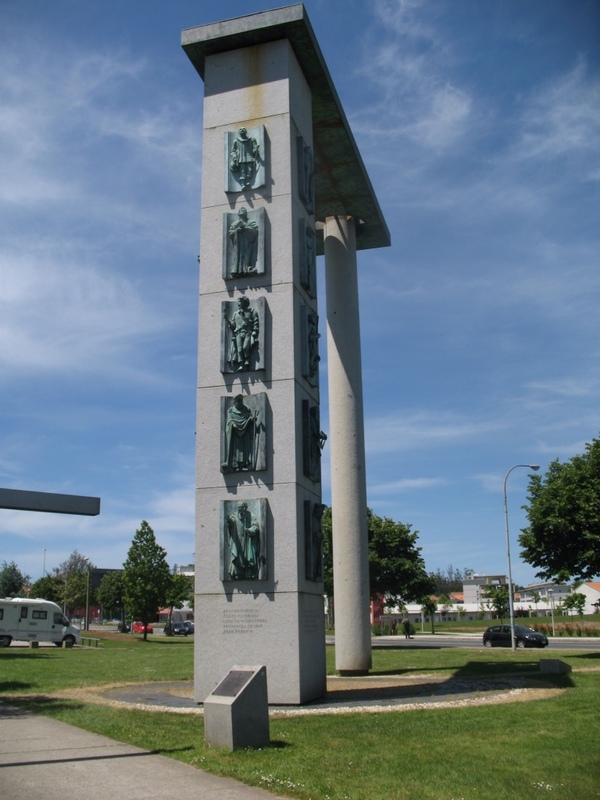 As Santiago or Saint Iago is credited with slaying all these enemies. 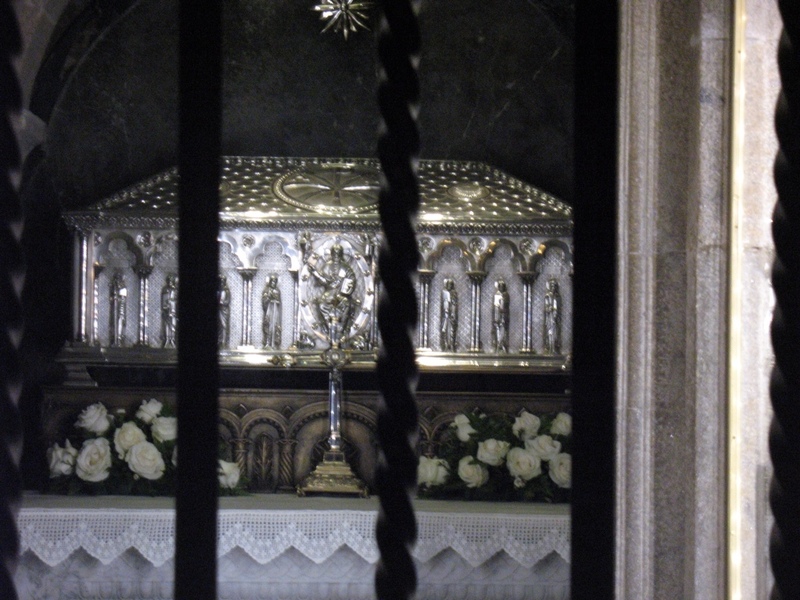 Jame's body supposedly landed here in its sarcophagus and the cathedral built to house his body. Cask with the relics of St James, aka Santiago, aka Saint Jacob. The guide told me today that they are all one and the same. 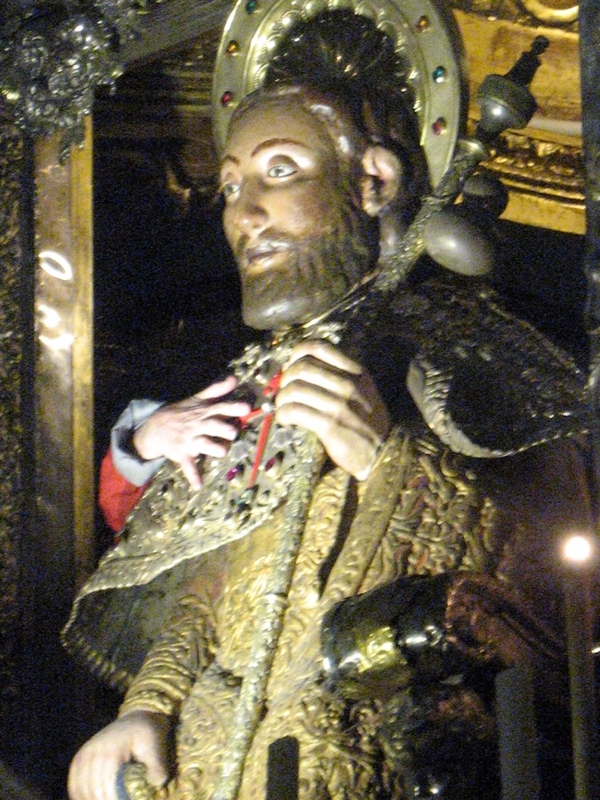 Santiago is the patron saint of pilgrims. All confusing to me. They have a massive statue of him and you can go up these ancient stone steps which are worn down in the middle, to go behind the head and shoulders of the statue. An ancient monk stands guard. Then people put their arms around it and lay their heads on his shoulder and say a quick prayer. It has to be quick as there is a big crowd behind. The hand on your left is a pious person having a moment. This fellow seems to have got a bit carried away. 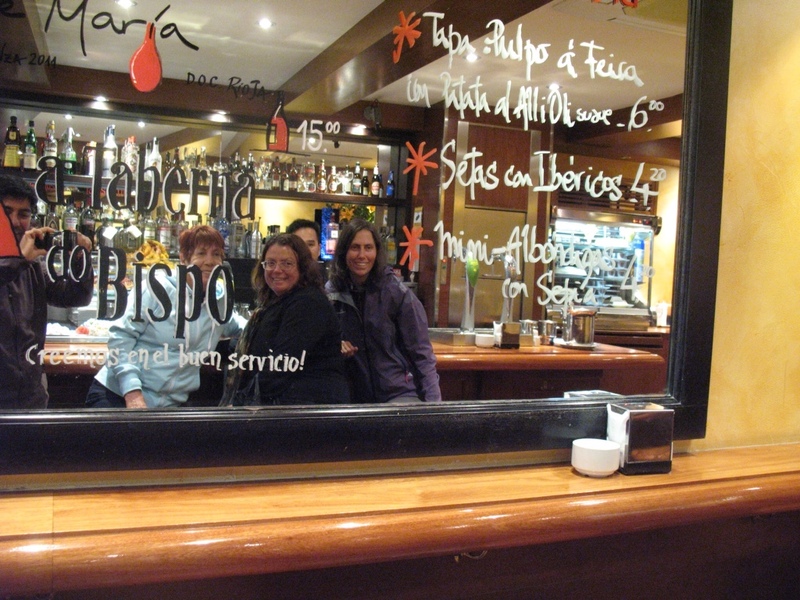 That done we went and found a nice tapas bar which I think, Carol who follows the blog, mentioned. It was very nice and quite cheap. Though nothing in the old city is cheap compared to just a few blocks away. In fact the OC is consumerism gone mad. 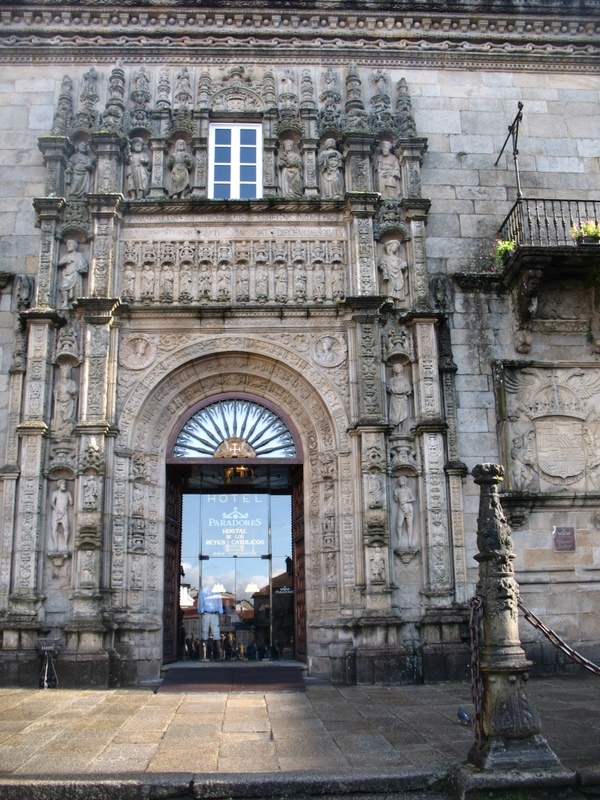 The pilgrim trade is extremely lucrative, and it is shop after shop of souvenirs and anything at all to do with the Camino. It goes from 3€50 to thousands, from plastic to gold, in fact any item that you could possibly imagine that is in anyway relevant. From pins, to enormous silver plated bono fumerios which are bigger than the one in the church. 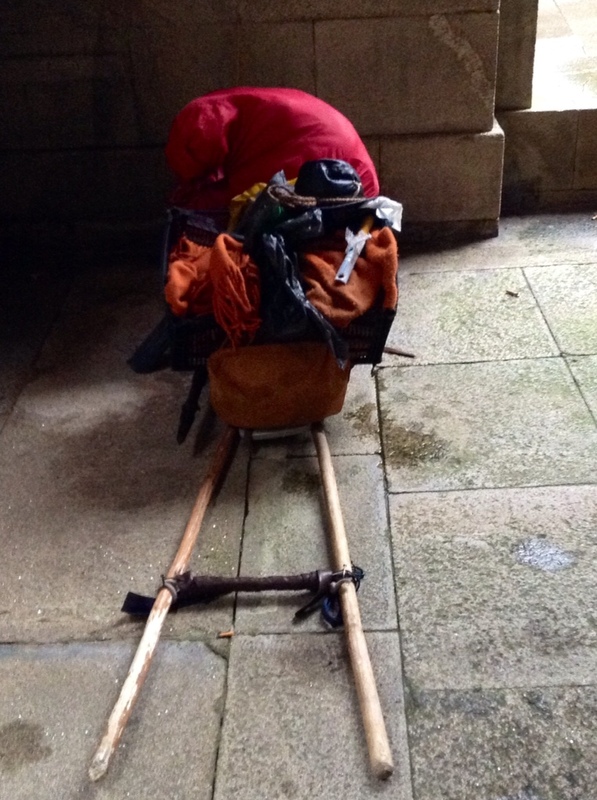 It is not a pretty sight, and to me tends to besmirch the supposed simplicity of the Camino. Maggie leaves in the morning and is off to Granada for a few days. She was hoping I might go to as she has booked a twin room. Lovely idea, but I really can't afford the air fare. I have changed my mind about the little room I was going to move into, although it was a good price. This hotel have offered me a good deal, even though it is stretching my budget a bit. 30€ a night including breakfast! plus they are nice and helpful and will ring a taxi for me on Monday. I feel comfortable and looked after so that made up my mind. Plus if I add breakfast to the other place, it would come to 20€, so it's only ten more. Di and Gil are now booked in here too, and arrive on the 22nd. It is going to be great to see them. Do t know how this one got in, but can't be bothered removing it. Not a great deal to report today. We had breakfast in the hotel, and they actually had cornflakes, no other cereal though. They even had square bread for toast, as opposed to the hard crusted baguette type. We then went through our bags and threw out some accumulated rubbish. As soon as that was done we went over to the midday mass at the cathedral. It was filled to overflowing, though I do think many of the people there went just to see the incense burner. I must be honest in that was the reason I wanted to go as well. It was, however, very moving and somewhat emotional as many people were in tears. 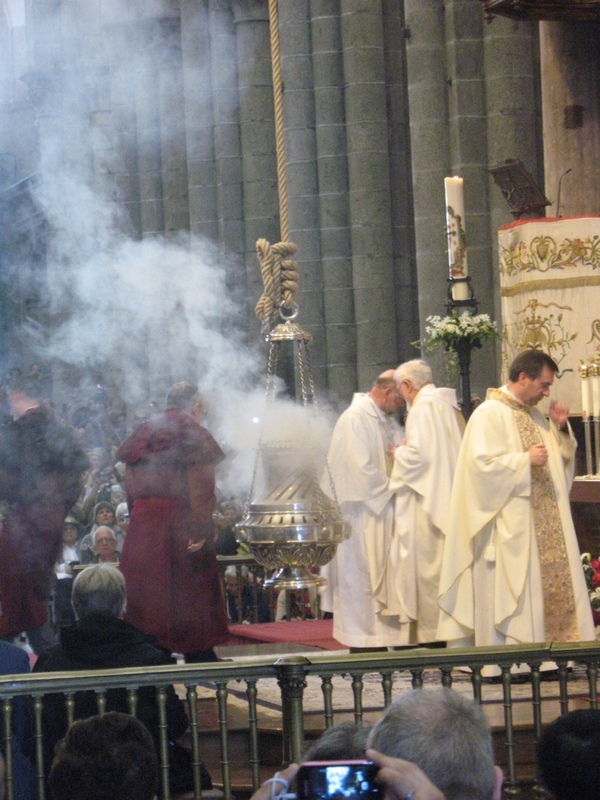 The mass was in Spanish, and even so when the priest began calling out names, it was very obvious that it was of people who had died or were sick, so that added to the emotional aspect. The bono fumerio was impressive as it swung back and forth in a huge arc for a few minutes. They also had a wonderful choir that sung very beautifully. I have some photos which I hope manage to capture some of the sense of the size of the mass, but my iPad won't download anymore, and I have no idea how to use the 'cloud' thingy. Tomorrow I hope I can find a photography place and see if I can get my photos taken off the iPad and onto a thumb drive. Then I can get more off the camera. As we walked down one of the many streets, well more like alleys really, we bumped into Chaya and Sherree. 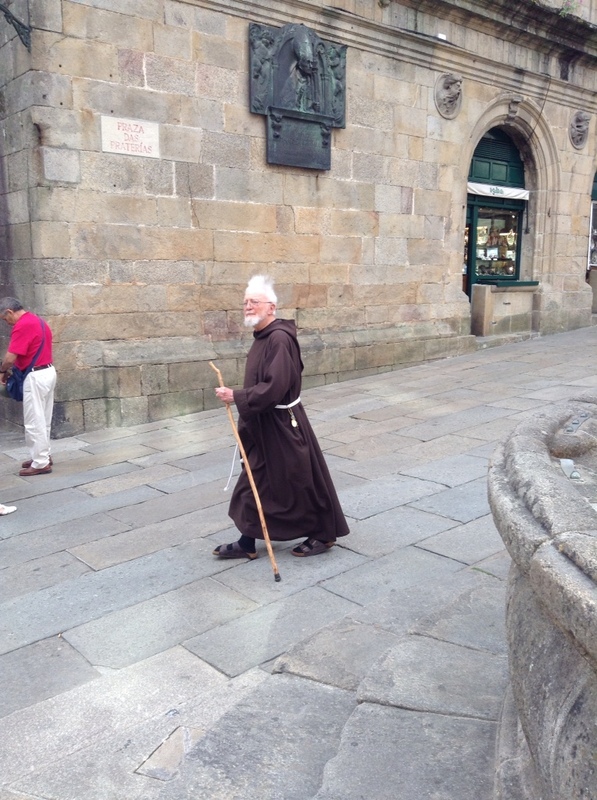 We had messaged them that we would meet in front of the cathedral but had missed them. Chaya, the nut, had a photo of me on her phone and had been asking people if they had seen me! She's a hoot. We agreed to all meet up at six thirty to catch up properly. 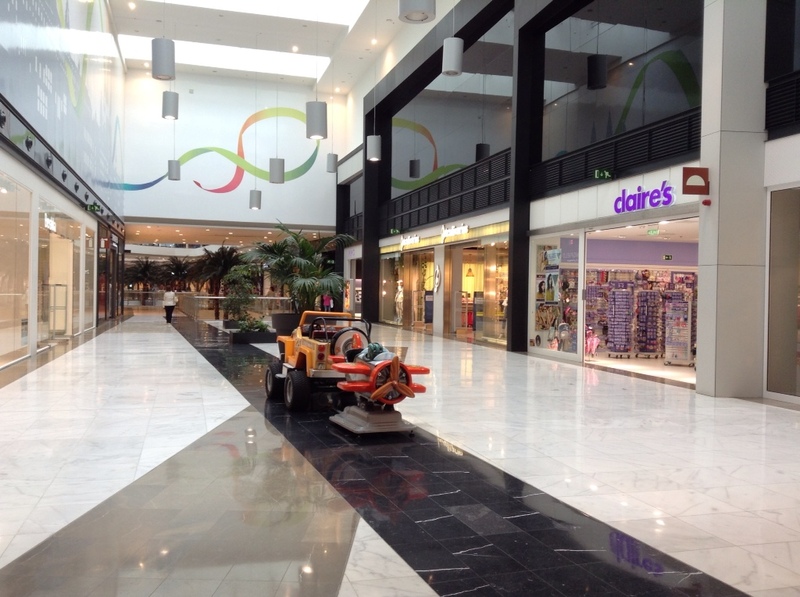 We then taxied out to a huge shopping complex which was very nice and modern. We went only so we could use the post office which is housed there. No one seems to know it exists as it is not mentioned on any of the forums. A very helpful woman at the Tourist information office got the information for us. She even rang to see if the complex was open. It was, as though it is Sunday, apparently yesterday it was closed due to a holy day. Therefore open today? Maggie needed to send her back pack on to Barcelona as she will stay there on her way home. Due to not walking today, we were very tired! When in Spain. We had a little siesta. We then met the girls and had a meal together. They are staying in a little private hostal, a bit like a rooming house? One of the ladies staying there is leaving on Tuesday, so she has arranged for me to take over when she leaves. I went and had a look and it is a nice little room, with a shared bathroom. It is 15€ a night! which is great! No outdoor area for drying clothes, but if needed there is a clothes line on the roof. The weather is about to change so that option won't be needed for a few days. We got the true story about the cyclist that died. Sherree was the first person to come on the scene. She got there minutes after it happened. He was actually hit by a taxi. When Sheree got there the driver and the passengers were milling around distraught, and waiting for the police. Sherrie was pretty upset and still is a bit. She said he had not been wearing his helmet. When Chaya came past a few hours later, the man was still there with just a sheet covering him. The police were there but obviously the coroner or whoever had not come. How awful that they had not erected a tent or something. So many people must have had to walk past. Very sad. I can, it seems, take photos on the iPad, so it must have different memory for storage. I only realised that tonight. I have no idea who he is but I liked it. Tomorrow I shall return to the big shopping centre because I need to get some clothes. Hopefully as it is away from the tourist area they might be less expensive. Maggie might come too, but she is meeting some people she met early on the walk, so we will see what happens. Di and Gilbert are only two or three days away. As much as I can get in the camera viewfinder. Will try better tomorrow. 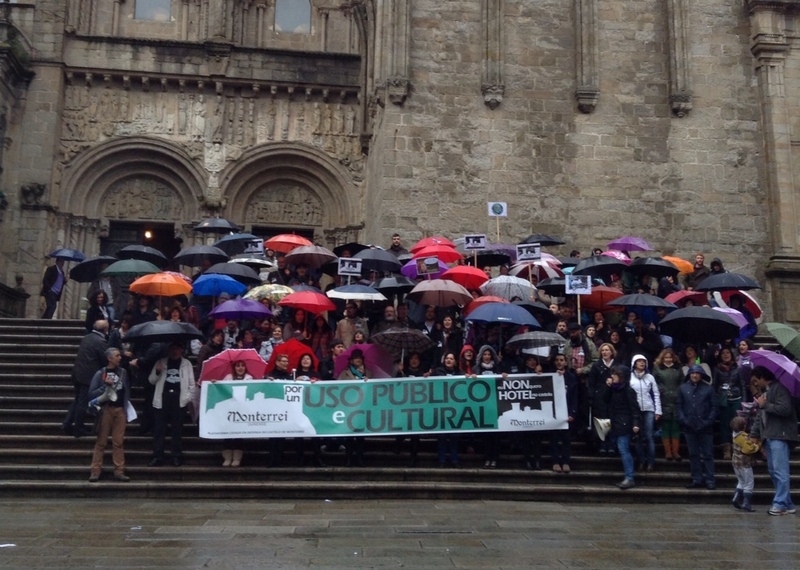 Those who are waiting for a rapturous, joyful exclamation due to arriving at Santiago please stop reading now. 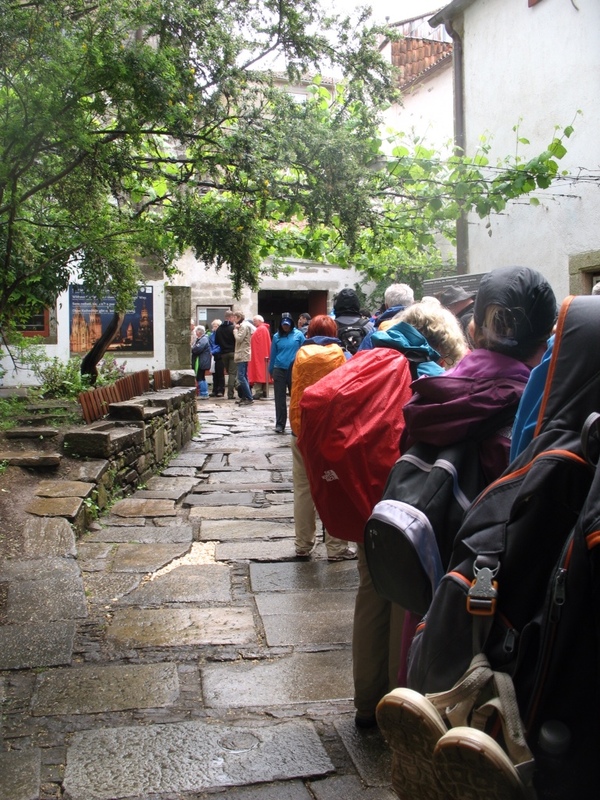 The walk into Santiago was not a daunting as some had said. The hill from Vilamaior was a stinker, and I heard one poor soul saying she thought the hills had finished! The walk up to Monte do Gozo was a stroll and barely even a hill. 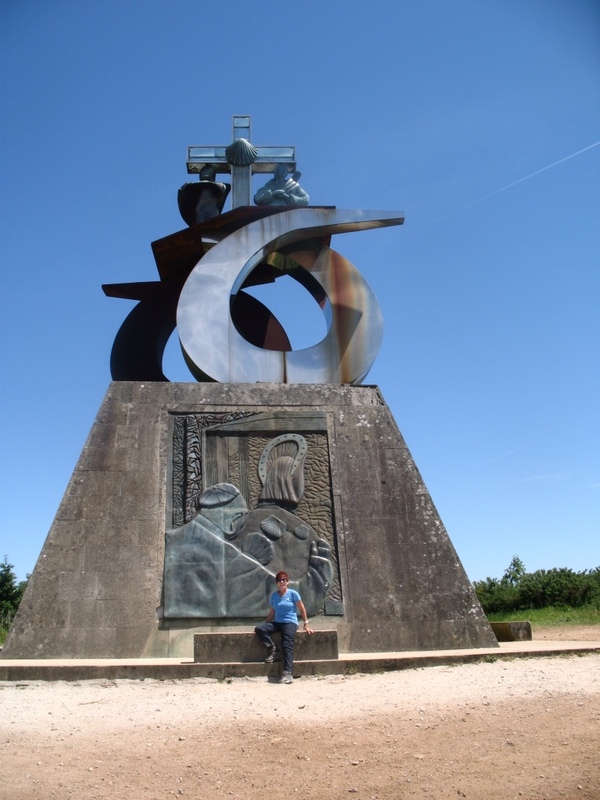 The monument commemorating the visit by Pope John Paul 11. 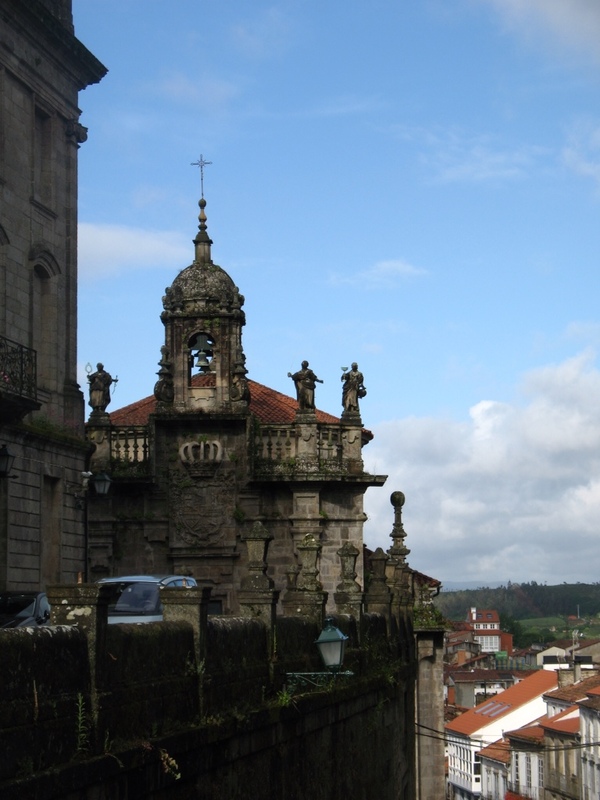 From this vantage point midieval pilgrims first saw the cathedral spires which gave rise to the name: Mount Joy. 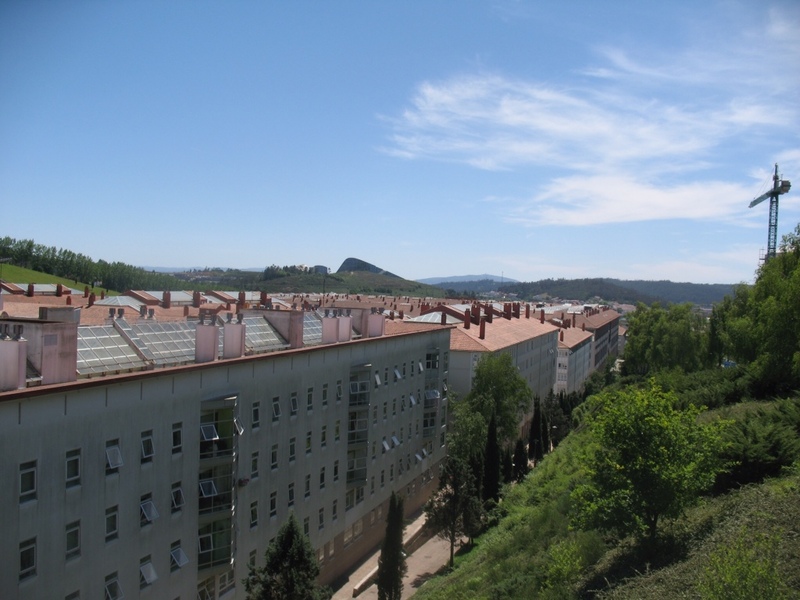 ” the view is now dominated by the sprawling suburbs of Santiago.” I arrived here with the French group, and another couple of young girls. We were all so disappointed, as we had really expected to see the cathedral from here. I suppose that means we should have done more homework. Later in the day though, when getting our compestellla others voiced the same disappointment. From the hill into the actual old city is about four and a half ks which seemed endless, as by about two pm it was really hot. I was pouring water over my head. Santiago just after the mountain of No Joy. Just on the very outskirts of the town they had some pretty impressive sculptures, but from there on it was pretty grim. There are rows and rows of these blocks of ugly apartments. This kind of overwhelming, overcrowded building seemed to go on forever. When finally I reached the cathedral it was at the blinking back of it. Apparently I could have gone down the side alley to get to the front, but I went in the back way and came out to the plaza that way. As I was alone I did not get a photo taken, though the French group were there, but I thought I would wait and get a picture with Maggie tomorrow. The old town which houses the cathedral is a great deal more interesting, than the suburbs, as it is so old, and full of character. There is lots of interesting alley ways and buildings hundreds of years old. I shall do lots of exploring over the next few days. Maggie has booked a twin room for three nights and asked if I would like to stay with her, and find myself a room when she leaves. That is what I am doing. It is wonderful to know that we are finished, and no more wondering how the next day will go. We are hoping to sleep in tomorrow but I bet we can't. Chaya and Sherrie are one night out and we will meet tomorrow. It will be great fun to meet up. Di and Gilbert are about four days away and I can't wait to see them again. 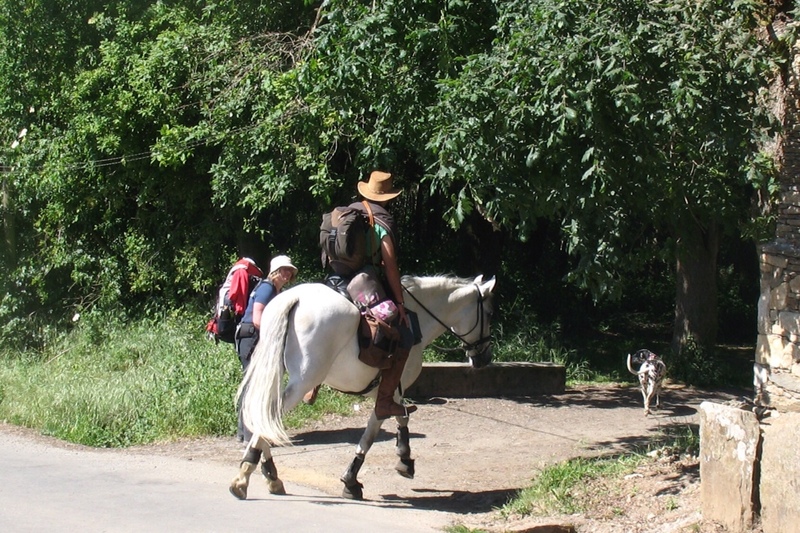 When I began walking today I was taking a photo when I heard the clip clop of a horse. I just leaned up against the wall and waited with camera at the ready. 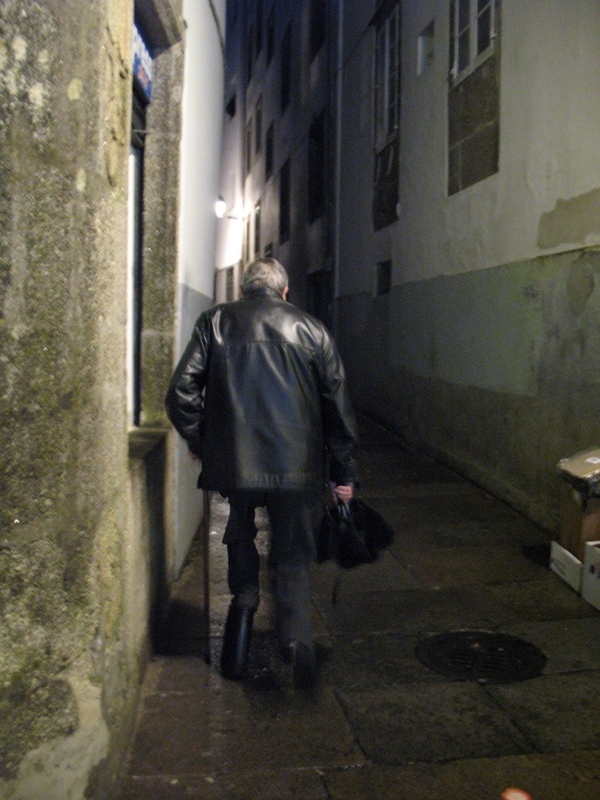 When Casanova came around the corner he laughed when he saw me waiting. I had the wrong setting on the camera and blurred the picture. How can you better a handsome man on a white horse! Pilgrim sign on the way in. 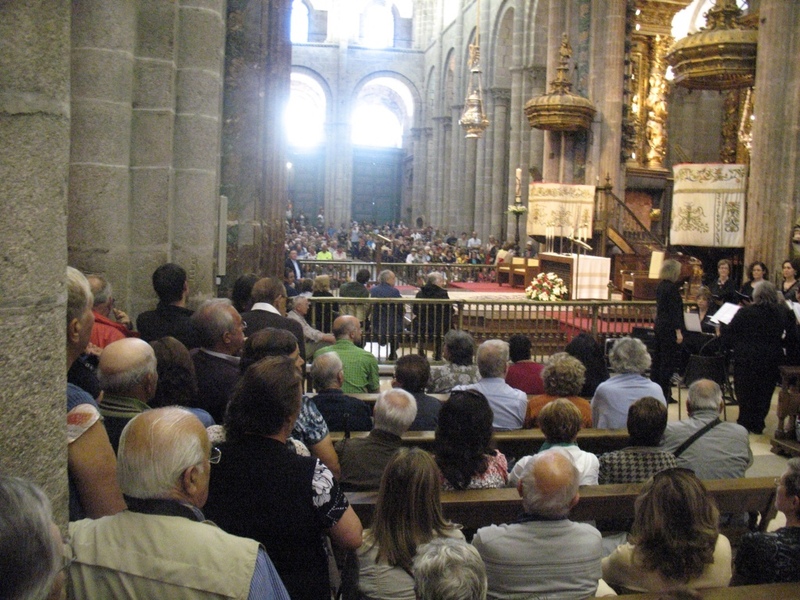 Tomorrow we will go to the pilgrim's mass which is at midday. 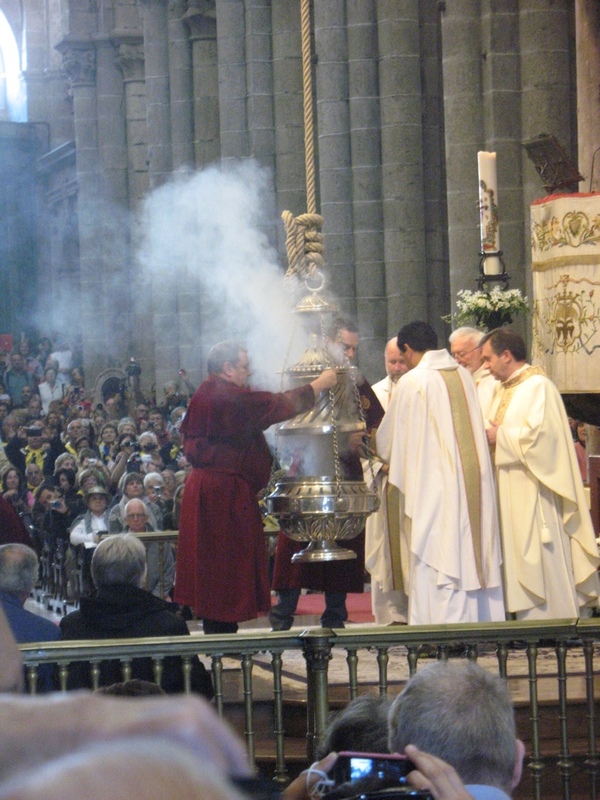 It should be very nice to see the big incense burner. I will light a candle for Lucianna as she has requested I do so. If they have the battery candles I shall go to the other church. 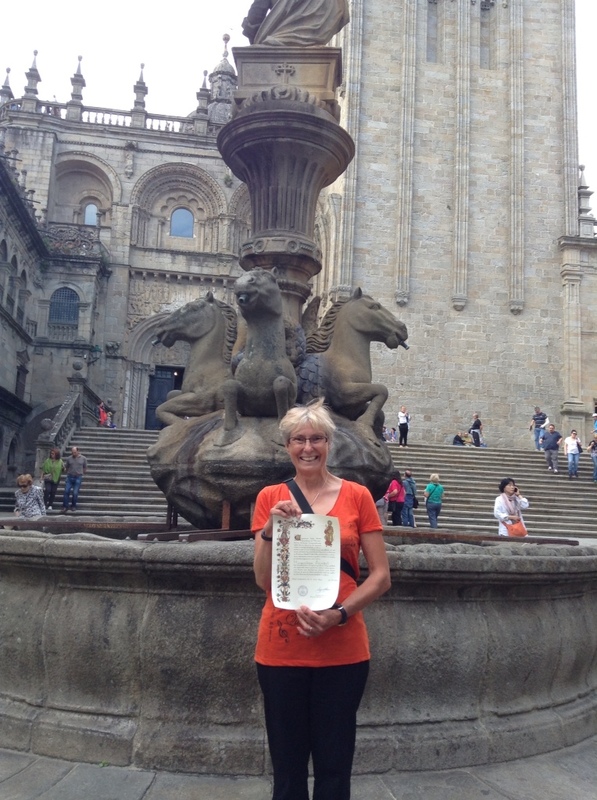 Well except for mass tomorrow here ends my Camino. I have walked approximately 560 kilometres, out of the 780 due to bussing here and there, and the odd taxi. I have no regrets about that and I'm proud that I have done what I have. 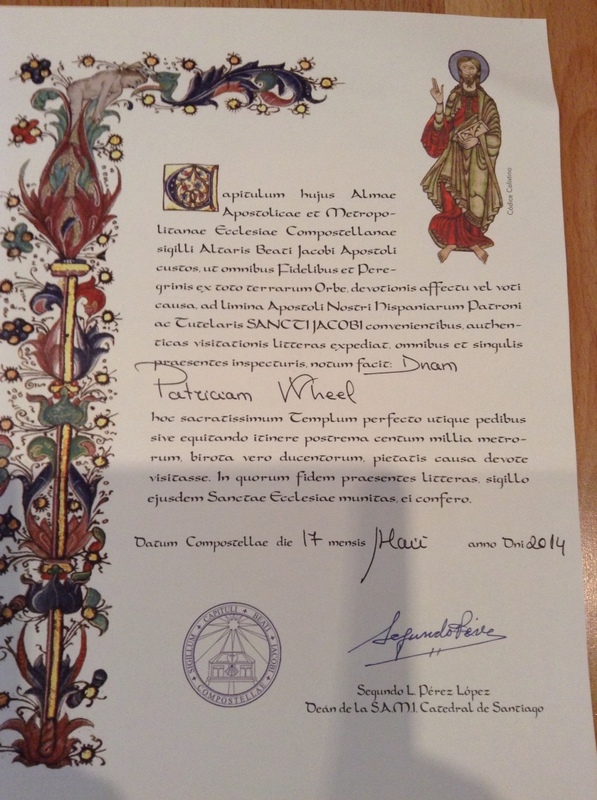 When I got my compestellla today, I was pleased when asked where I started, as a hundred ks from Sarria seems little in comparison. It does feel kind of strange to not be walking tomorrow. I'm glad I did this, as I have had some good times, met great people, and when it becomes more retrospective I expect I shall find more and more pleasurable memories. I will continue to blog the rest of my stay here, and my few days in Barcelona.hopefully some of you will keep reading. There was quite a bit of discussion this morning about the unbelievable noise last night. The lovely French group were looking very sleep deprived. Maggie has wonderful ear plugs, which I intend to get for future snorers back home. They are hearing aids, without the hearing apparatus. She sleeps through it all! The fellow who got the pull out bed was still fluffing about doing his sodding laundry at ten thirty. The breakfast was the damned rock hard toast with jam, which I paid for but did not eat. My lips are red raw from the very very hard baguette type bread so popular here. I know in this place I could have ordered eggs, or even crepes, but what can you do when, as is the norm here, one poor sod is trying to serve about thirty people. I decided to wait for the first cafe on the Way. How can four ks be so long. Everything is up hill, and we just about fall into chairs when we reach one. Yay! At last. I ordered a templada, which was huge, but I managed to get through it. The day got hotter and hotter but for most part we had shade, thank goodness. Then after over five hundred kilometres I got a hot spot on my right heel! I am so angry. We stopped where some ladies were having a “spa” and put on some Fixamol but I think I am in for it tomorrow. I shall carry my sandles just in case. My silly foot decided to remind me about the fibroma later in the day, but after a rest it feels better. One of the ladies cooling and creaming her feet. I just saw her in the cafe where I am writing and she asked me for a copy of this picture. I emailed it to her and she kissed me. She's Italian. Unfortunately the email did not go through and an hour was wasted as I tried using the iPad translater app to ask her to give me a friend's email, so s/he could then forward it to her, as often hotmail seems to not like gmail. We got nowhere but I did suggest she delete some of the 177 emails in her inbox. I showed her how and left her busily deleting. The cafe where we ate was really nice. I had lasagne, nothing like Lucianna makes, but ok. Then I had a yummy chocolate cake. For some reason the owner gave me the cake without charge. So back to the walk. Not very different to yesterday scenery wise. I would like to say we walked again to the sound of birds chirruping, and babbling brooks. Alas, it was to the sound of yabbering people. The track is heaving with people, who have joined in from Sarria. For some reason they seem to want to dash along talking at the top of their voices hell bent on beating some record they have set themselves. The many people on the track. The newbies still with backpacks. Well not the SA ladies, they just have water bottle holders. We had to cross this road and the cars are speeding by. One idiot nearly ended up a hood mascot. Difficult shot as sun was in my eyes. I lashed out three euros and bought me a teeny little horreo. Out of the blue Casanova turned up. Sigh. The biggest bugbear from the beginning has been the bloody cyclists. They do not have bells. 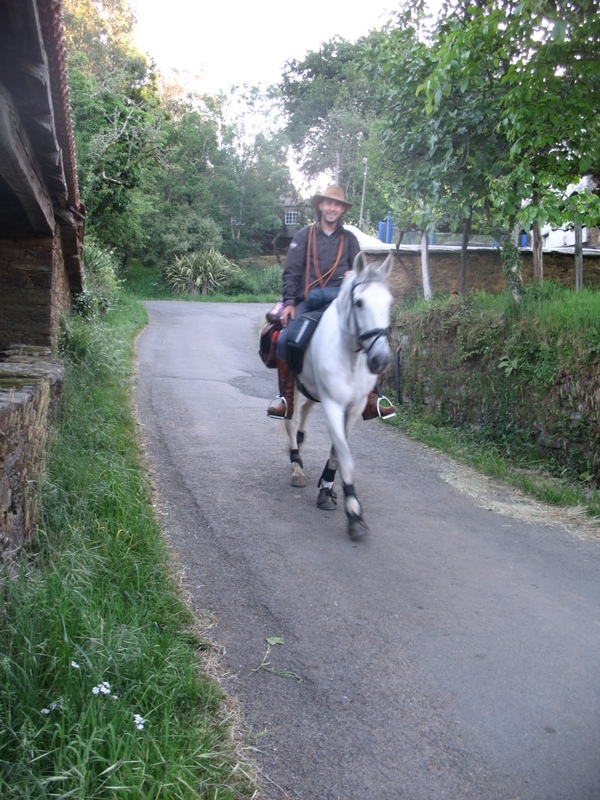 They come flying down the hills at horrendous speeds, and some give a little whistle, while others call out Buen Camino. Those do not denote cyclist to anyone, as it could be anyone walking doing either. Two people that we know of have been run down and badly injured, and Maggie had her backpack hit. Only one fellow, plus a married Australian couple have rung bells. Now, when you hear a bell tinkle, you know it's a bike, so you step to the side. Goodness knows how many others have been hit. 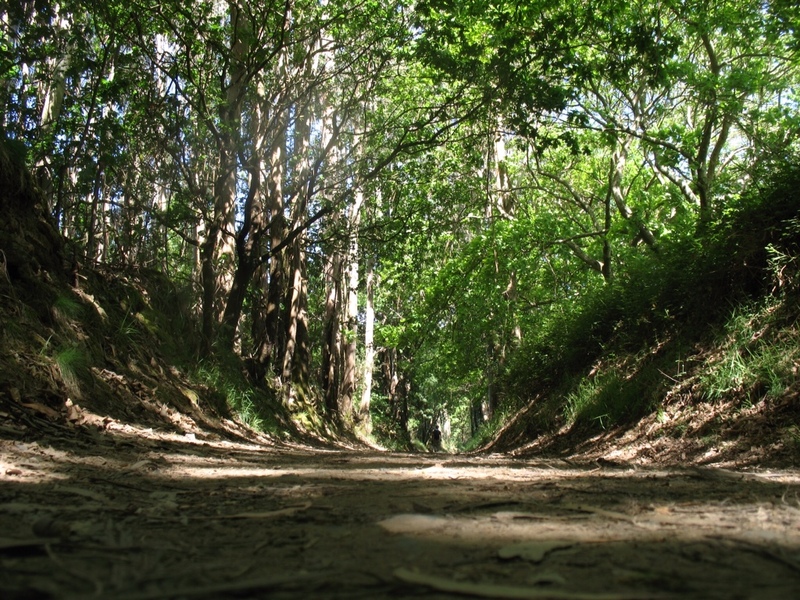 A shady track with nice soft sandy ground. I think she just likes watching the people pass by. I must go to sleep now. No wifi in the dorms, so will post this in the morning. There is just four of us in this room. Two men and us. The young bloke is not in yet so no doubt we shall all be woken when he comes in. Now 10.30. This room has only 10 bunks and quite roomy. The head room is the lowest so far. I have hit my head three times so far. 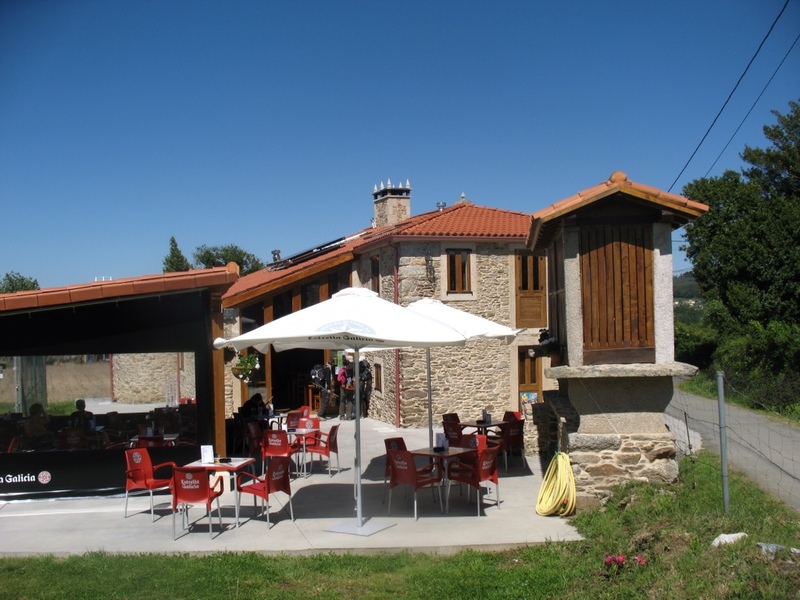 This Albergue is called Edreira and very nice and new. They don't offer meals, but have a good kitchen. It is ten euros for the bed. 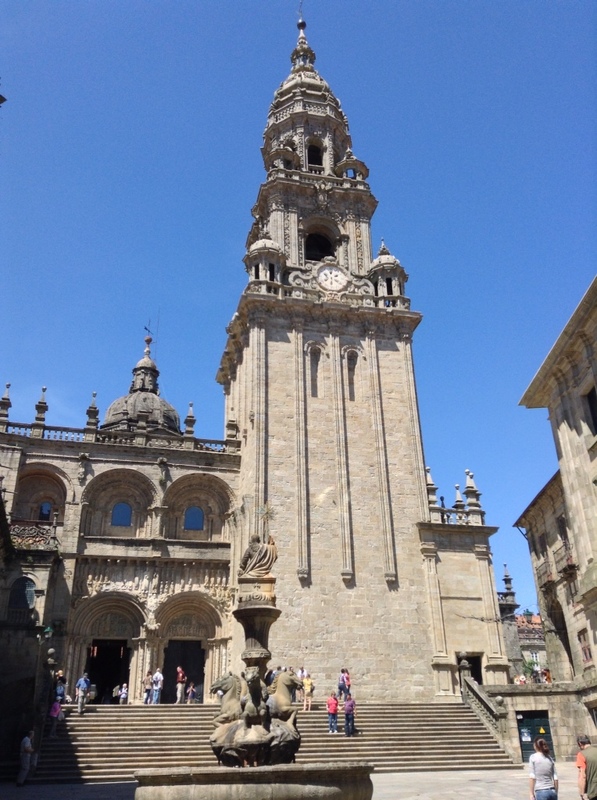 Tomorrow is a 21.5 walk into Santiago and there is a nasty hill/ mountain to get up which when at the top we can see the cathedral. I'm dreading it, because I know by the time I get there it will be stinking hot. Yuck. I was going to stay about five ks out and walk in early but might as well bite the bullet. Maggie will try and push on faster as she has luggage to pick up by two. If not she can't get it until Monday, but she wants it all organised ready to fly out on Tuesday. 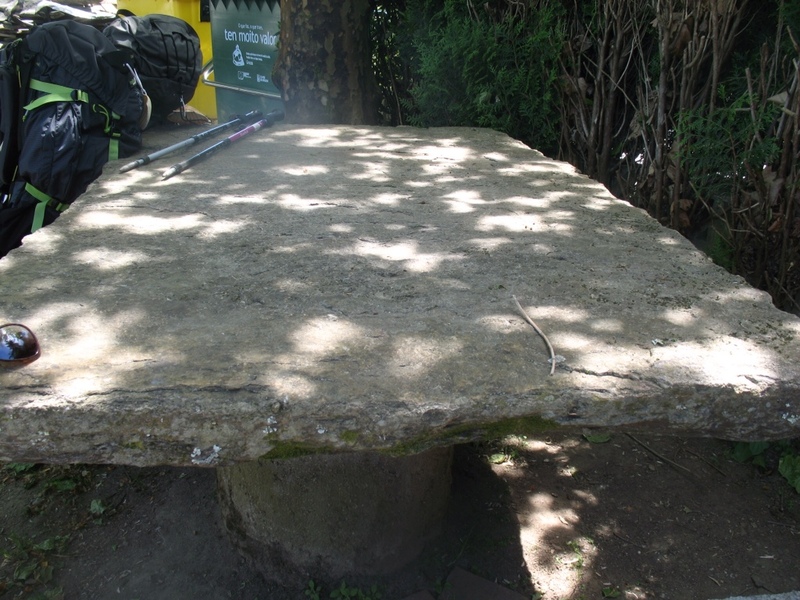 Chunk of stone for a table. 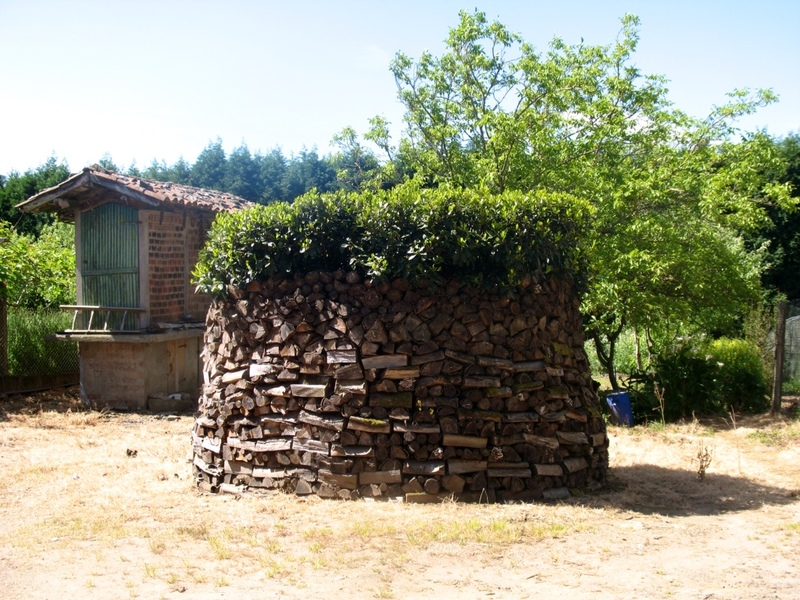 Would you believe this is a wood pile ? Well hopefully my next post will be from Santiago. Now in kitchen having cornflakes. Maggie has taken off in the hopes of getting there by two. I forgot to mention that the other day when we were in the albergue where I took the photo of the five of us having dinner, Maggie asked for a boiled egg for breakfast the next morning, and sadly got no response. As I passed the kitchen I heard the familiar sound of a fork beating on a metal dish. Quick as a flash I tapped on the door, and said, “Dos, dos.” She served the fellow who order the one she was making, but it was sandwiched between big chunks of bread. I said, “Nada pan,” and in a few minutes time I had an omelette. This morning when we stopped four ks away from our hostal for our breakfast, I said huevo and did the old whisking motion, and so I had omelette for breakfast. Not long after breakfast the French group from last night came around the corner. 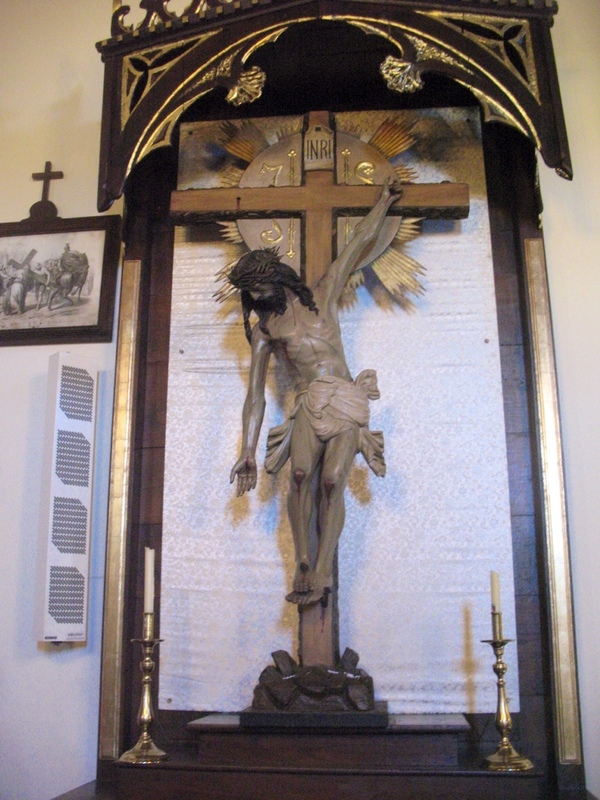 They said we must visit the church as it had a very unusual Christ figure. 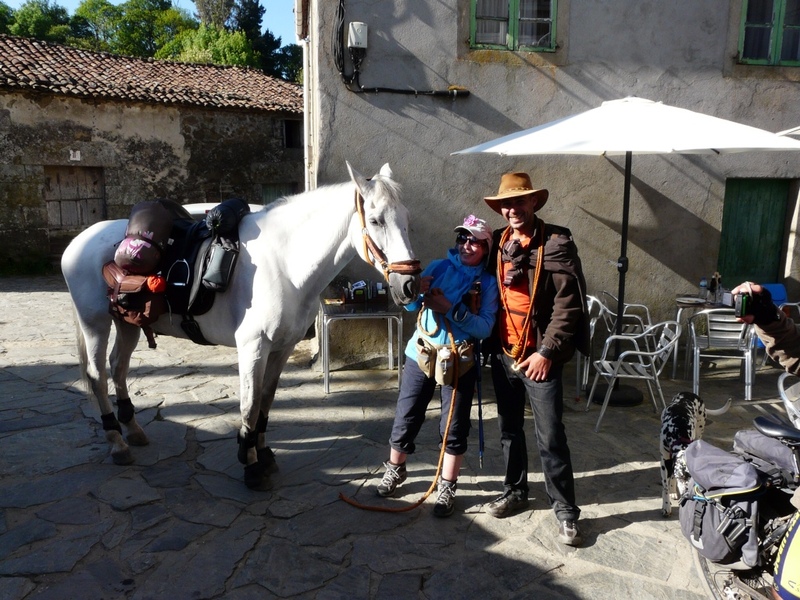 Prior to the church visit, Casanova came along, on a lovely white horse which he asked me to hold while he went to get water. Well, this was all implied with gestures. 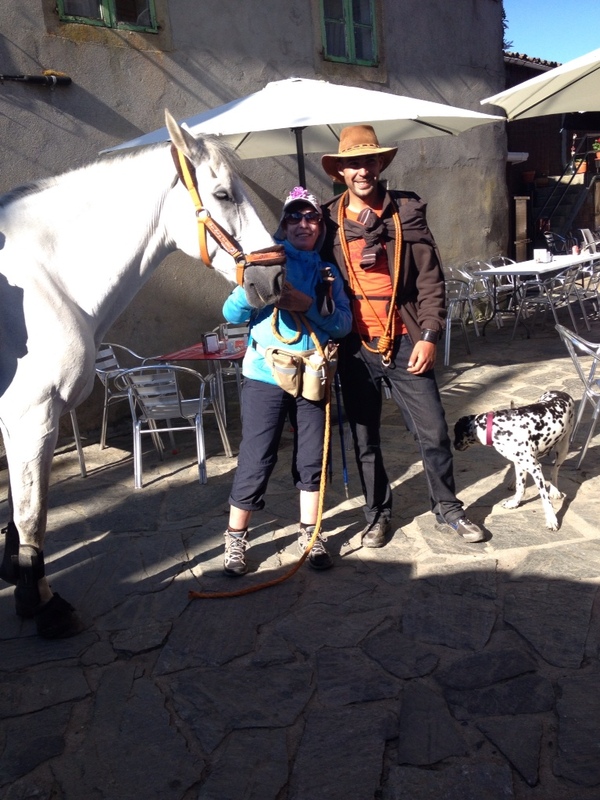 I was thrilled to hold the horse, it was so sweet. The French and Maggie took pictures, but no one told me too change sides, so I would get some light on my face. Probably just as well. Maggie got the best shots. 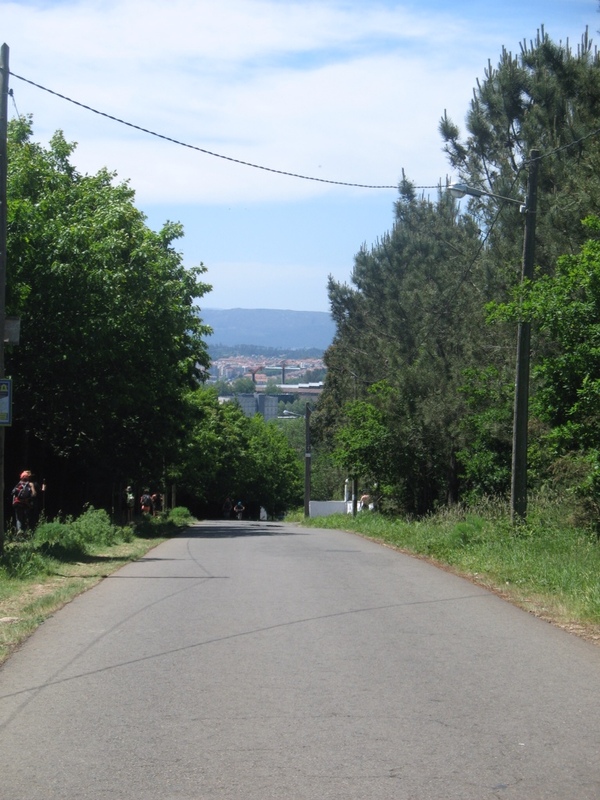 Today was quite a harrowing day, as some of the inclines were very steep, and although we started the day with gloves on because of the cold, it got hotter and hotter as the day progressed. 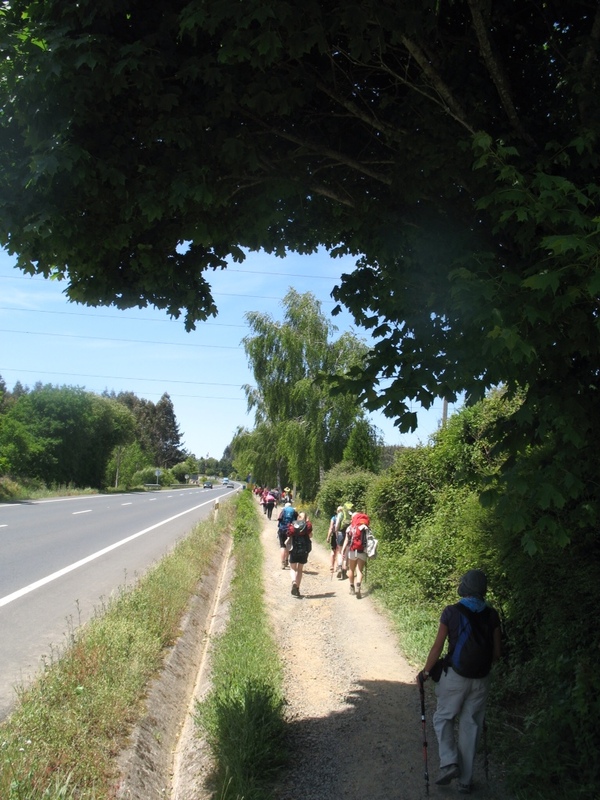 It reached 27 degrees and most of the walk was without shade. When we got into town it got hotter as the sun bounced off the pavement. There was a few blessed shady spots which we cherished, and a couple of sections where we had flat terrain. For the most part though it was a bit of a trial. We did 20.1 ks today and I really felt the last few, and the first few, oh, he'll, the middle bits too. First coke stop, after breakfast stop. Boente. Another stop for a rest. No idea of the name. 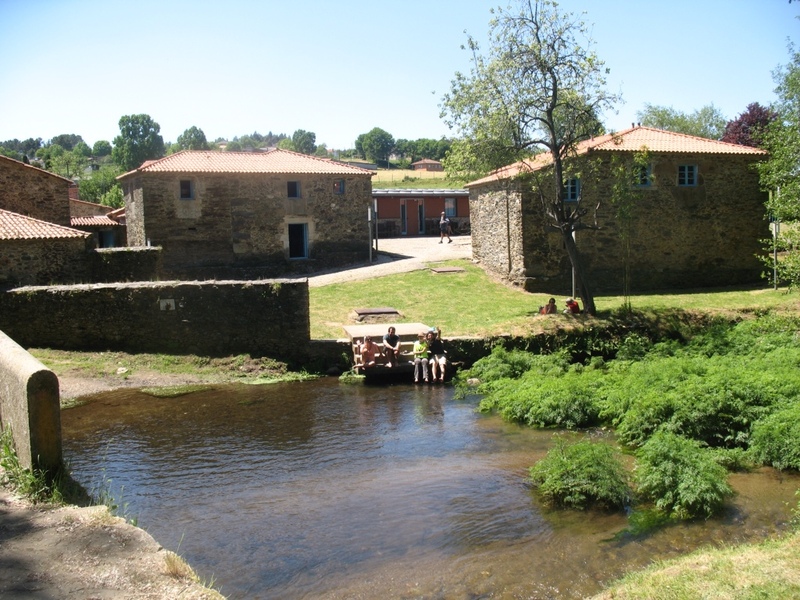 This is the beautiful little village, Ribidiso, where I was going to stay, until we decided to go on to Arzua. It is absolutely charming. How I envied this group sitting there dangling their hot feet in the cool crystal clear waters of the Rio Iso. We, though, had another gruelling 3.1 ks to go. Well at least that's three less tomorrow. 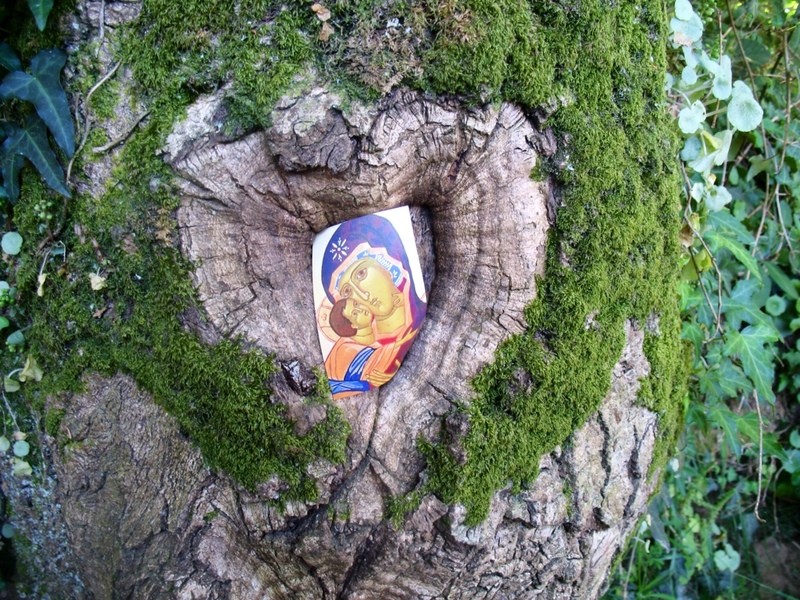 This picture was tucked into a heart shaped knot in a tree. Sweet. These people have built in the bottom of their Horreos. Cute. Can't wait to clone out some of these wires. 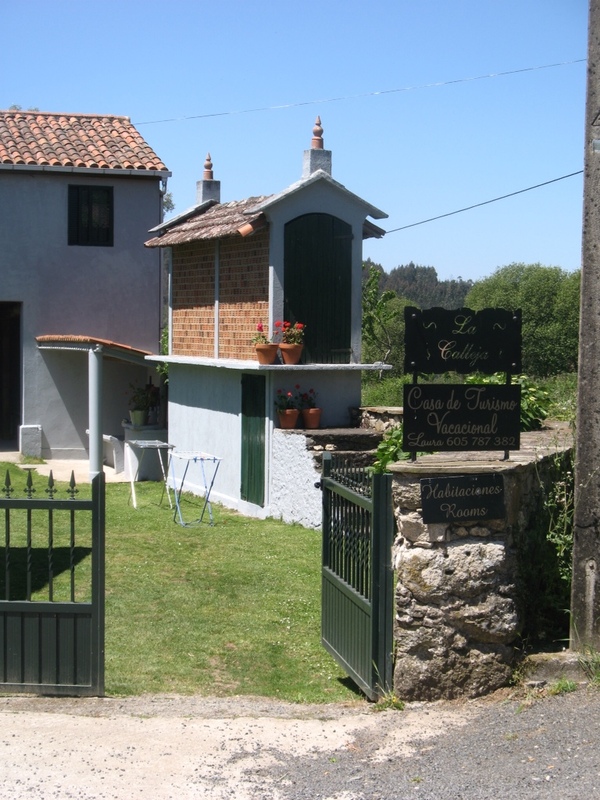 The albergue we are in is very nice and clean, with separate showers for men and women. The water is hot, and works with a tap handle as opposed to pressing a button to get 30 seconds of water. It is, though a sixty bed room. I'm too old for this mix of people. I was naked in the bathroom and a fellow came in by mistake, giving us both a shock. Which reminds me. In, I forget where, but in a cafe there were several women waiting for the toilet. I was busting so I went in the men's. 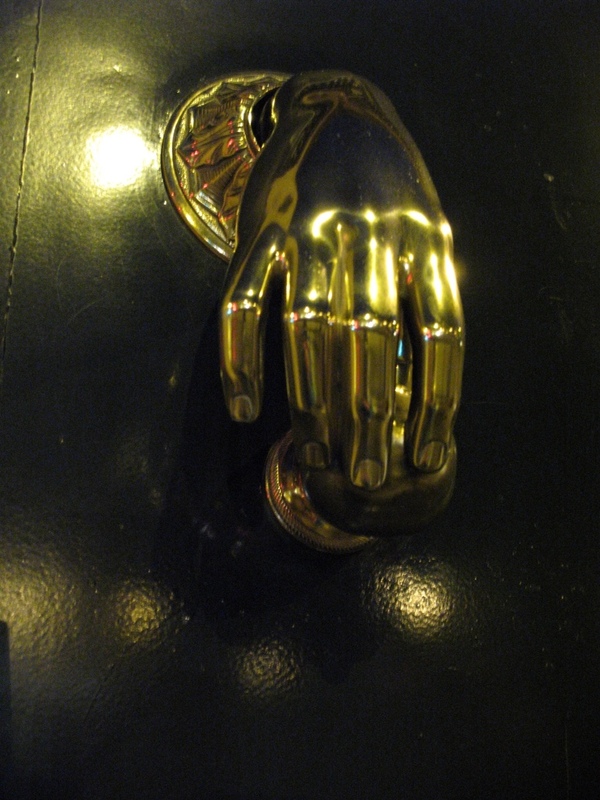 I walked passed the urinal, of course, and went into the sit me down loo, making sure I locked the door. Well the door did rattle so I did a deep muffled sound and was left in peace. When I opened the door, however, there was a fellow using the urinal. I squeaked, he grunted ( cut off mid stream I think) and I closed the door quickly. A few minutes later he called out 'finito' and I slunk out feigning surprise at the “hombre” written on the door. Anyway back to this place. 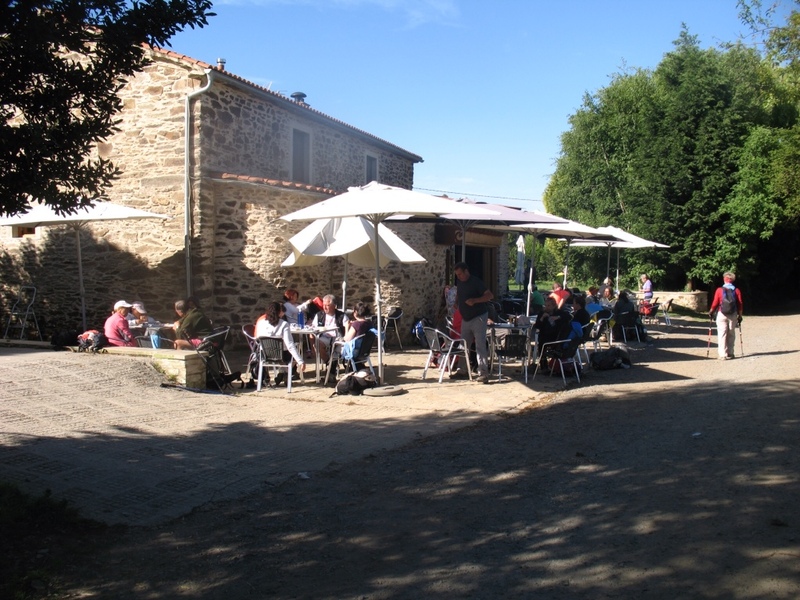 They are a restaurant as well as an albergue so it's pretty noisy still, at ten pm. Plus the dorm is full to overflowing. There is a couch which is a pull out bed, at the foot of my bunk, and some fellow has just been given it. Above me is a girl about twelve who has not stopped jumping around for about an hour, which shakes the bejesus out of the bunk. She also keeps farting. There is a group of people just outside the door still partying on. The Spanish don't talk, they yell. Some blokes have just come in to the dorm and though the lights are out and most trying to sleep they are yabbering away. 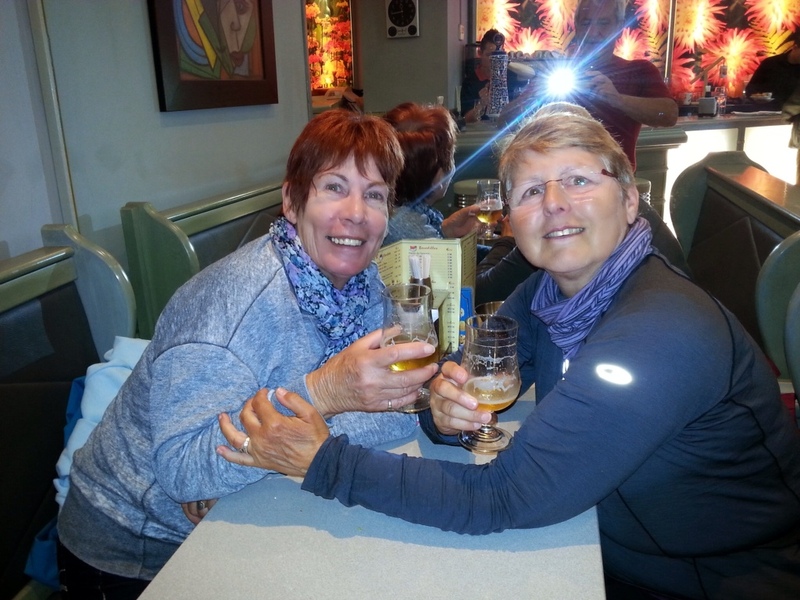 We met two South African women today who are doing the Sarria to Santiago in style. All done through an agent, hotel to hotel. 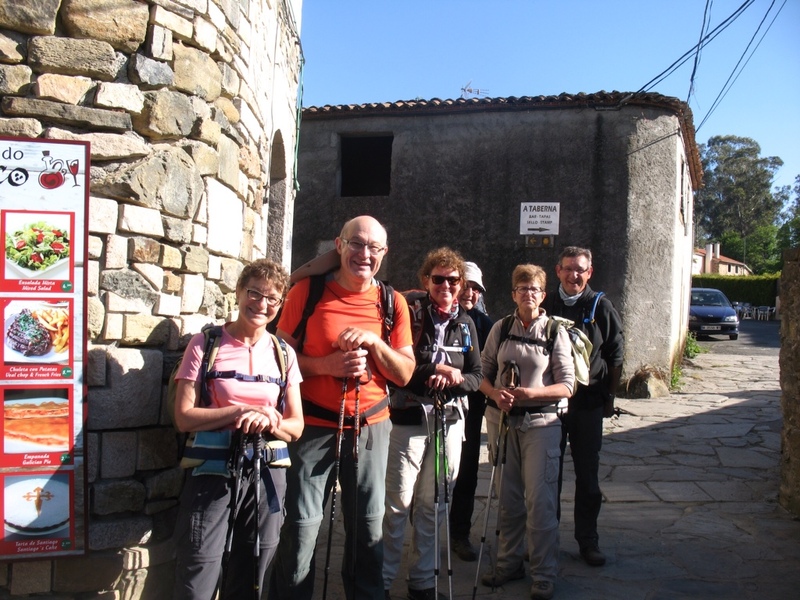 The problem with that is some towns/villages don't have hotels, so today they had to walk ten more ks than us. Still they looked fit and young enough. Must be nice to be rich. Hmm, I don't think they will get much interaction with locals or other travellers that way though. The noise from the restaurant is getting louder. The girl above me has worms I think. I feel like I'm on a freaking boat she is rocking about so much. Cripes, now she is having a coughing fit, which is escalating the farting. Ah, well in with the ear plugs, but they can only do so much. Ah, well I have this.